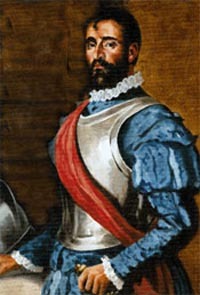 Francisco Hernández de Córdoba, mortally wounded after being violently rejected by the Mayas of Yucatan, makes a brief stop in Florida, where his men also are attacked by natives and where his chief pilot, Antón de Alaminos, is wounded by an arrow in the neck. 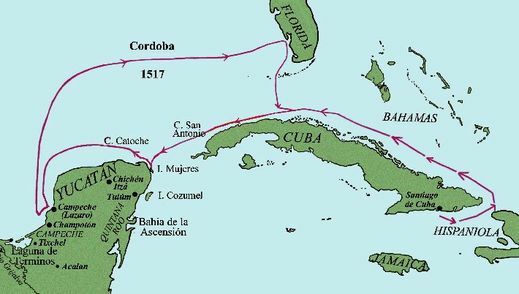 Hernandez de Cordoba died shortly after they returned to Cuba, but De Alaminos steered another expedition to Yucatan one year later. 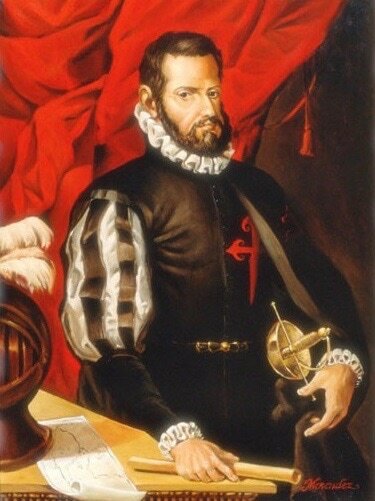 Francisco Hernández de Córdoba, herido de muerte tras ser rechazado violentamente por los mayas de Yucatán, hace una breve parada en Florida, donde sus hombres también son atacados por los nativos y donde su primer piloto, Antón de Alaminos, es herido por una flecha en el cuello. Hernández de Córdoba murió poco después de su regreso a Cuba, pero De Alaminos dirigió otra expedición a Yucatán un año después. 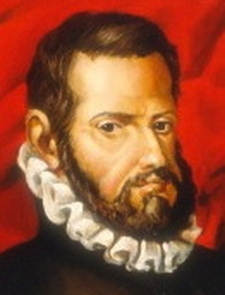 Juan de Grijalva charted Mexico's Gulf coast all the way to Galveston Island in present-day Texas. Antón de Alaminos was his pilot. 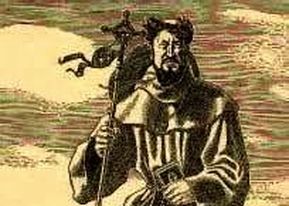 Juan de Grijalva trazó la costa del Golfo de México hasta llegar a lo que hoy es Galveston Island, Texas. 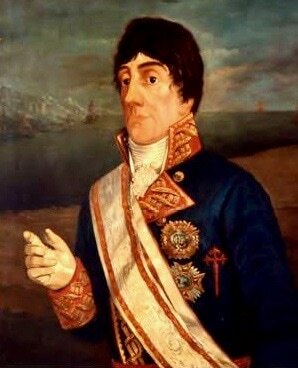 Antón de Alaminos era su piloto. 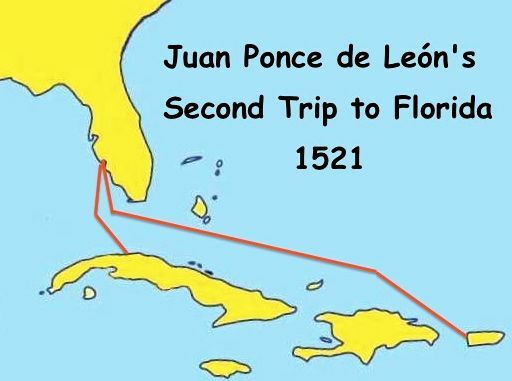 Juan Ponce de León returns to Florida in Spain's first effort to establish a permanent colony in the land he had discovered and named eight years earlier. 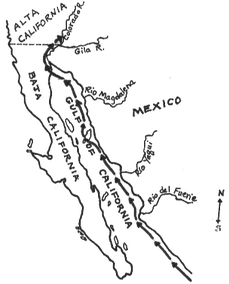 His two ships and 200 colonists land in the vicinity of Fort Myers, but they are driven back into the sea by attacks from Calusa Indians. Ponce de Leon is mortally wounded by a poisoned arrow, the colonization effort is abandoned and he is taken to the newly established city of Habana, where he dies in July of 1521. 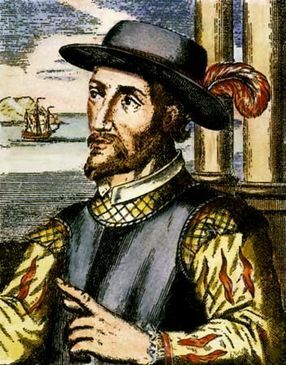 Juan Ponce de León regresa a la Florida en el primer esfuerzo de España para establecer una colonia permanente en la tierra que el había descubierto y nombrado ocho años antes. Sus dos barcos y 200 colonos desembarcan en los alrededores de Fort Myers, pero son rechazados de nuevo al mar por los ataques de los indios Calusa. 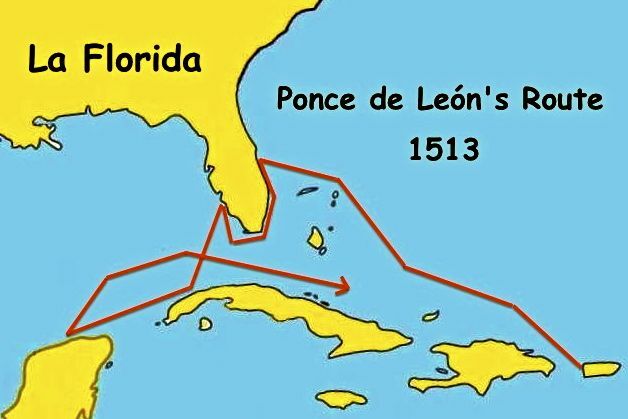 Ponce de León es mortalmente herido por una flecha envenenada, el esfuerzo de colonización se abandona y se lo llevan a la ciudad recién establecida de La Habana, donde murió en julio de 1521. In 1524, Giovanni da Verrazano, an Italian explorer in the service of France, sailed into New York Harbor and explored the Northeast Coast in search for the Northwest Passage. 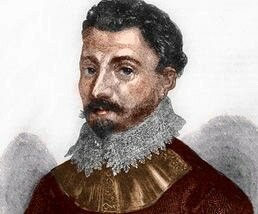 En 1524, Giovanni da Verrazano, un explorador italiano al servicio de Francia, navegó en la bahía de Nueva York y exploró la costa noreste en busca del Paso del Noroeste. 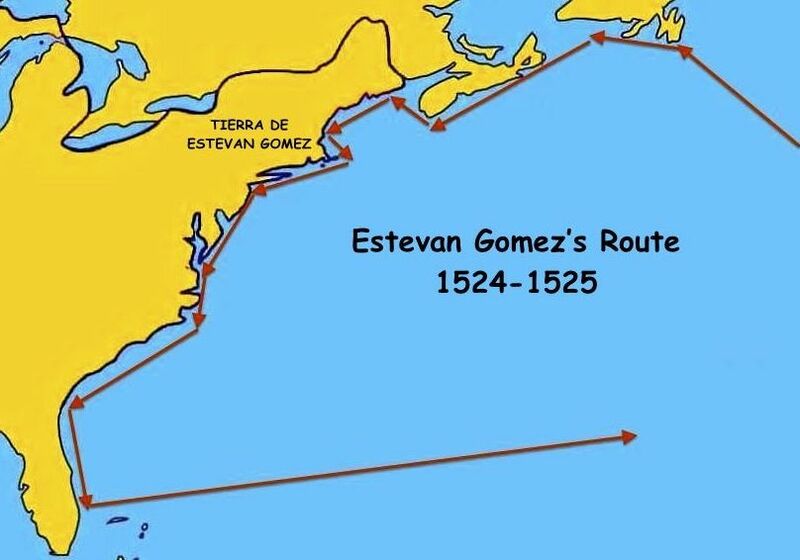 Estevan Gómez, un explorador portugués que navegó para España, hizo mapas de la costa noreste, entró a lo que ahora es el puerto de NewYork y le dio el nombre al "Rio San Antonio", ahora conocido como el río Hudson. Basado en expedición y reclamos de tierras, un mapa de 1529 describe la totalidad del actual noreste de EE.UU. como la "Tierra de Estevan Gómez". Hernando de Soto and his men explore the territory that later became Florida, Georgia, South Carolina, North Carolina, Tennessee, Alabama, Mississippi, Arkansas and Louisiana. They celebrated America's first Christmas and discovered the Mississippi River. Their four-year, 4,000-mile hike finally lost its drive when de Soto died of fever at the banks of the Mississippi, where he was buried in 1542. Read more: America's First Christmas. Hernando de Soto y sus hombres exploran el territorio que más tarde se convirtió en Florida, Georgia, Carolina del Sur, Carolina del Norte, Tennessee, Alabama, Mississippi Arkansas y Louisiana. Celebraron la primera Navidad de Norteamérica y descubrieron el río Mississippi. 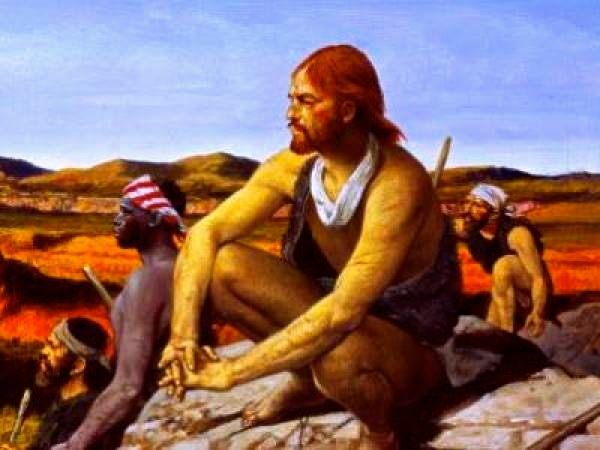 Su caminata de cuatro años y 4.000 millas finalmente perdió su impulso cuando de Soto murió de fiebre en las orillas del Mississippi, donde fue enterrado en 1542. 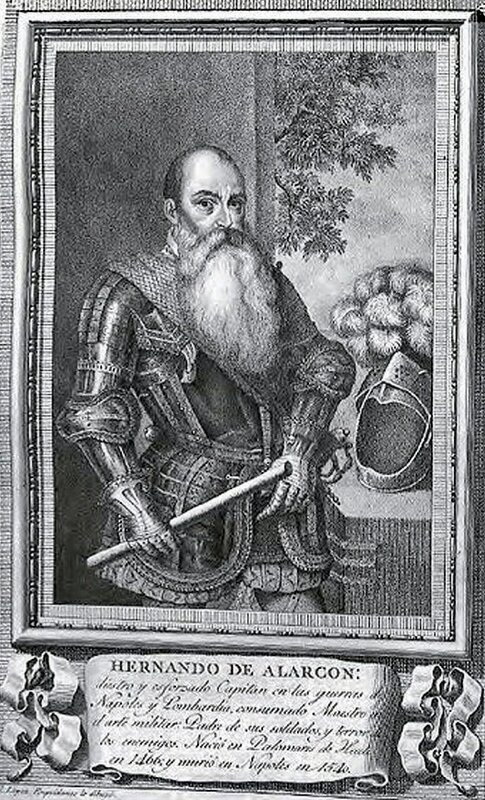 Francisco Vásquez de Coronado explora el territorio que abarca la actual Arizona, Nuevo México, Texas, Oklahoma y Kansas. 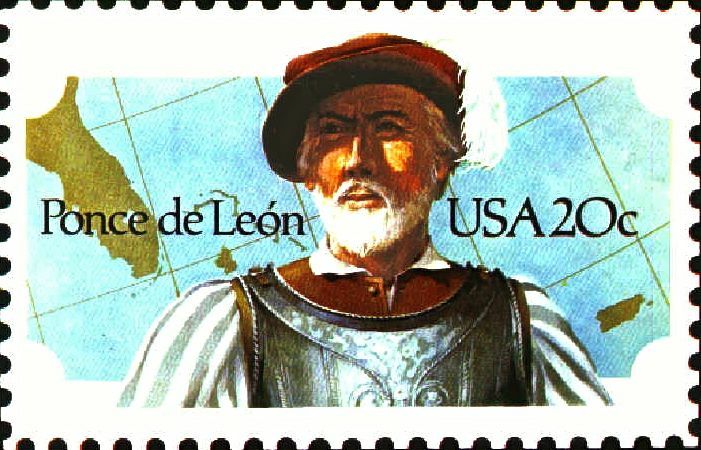 Spanish explorer Hernando de Alarcon sails northward from Acapulco, along New Spain's Pacific coast, through the Gulf of California, enters the Colorado River, and becomes one of the first Europeans to reach what it is now California. He also confirms that California is not an island. 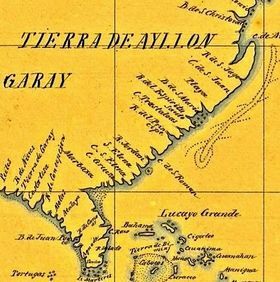 After sailing with three ships and for three months, avoiding sandbars that slowed the journey, de Alarcon finds the mouth of the Colorado. He selects about 20 experience seamen, takes two boats, and spends 12 days leading the first Europeans to ascend the river for a considerable distance. 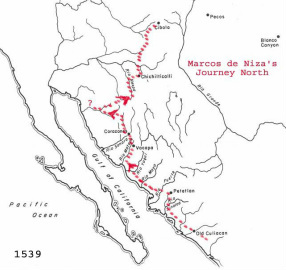 ​ Their mission is to meet and resupply the simultaneous overland expedition into North America led by Francisco Vasquéz de Coronado. Although the meeting is not realized, de Alarcon's expedition finally discards a fictional legend. 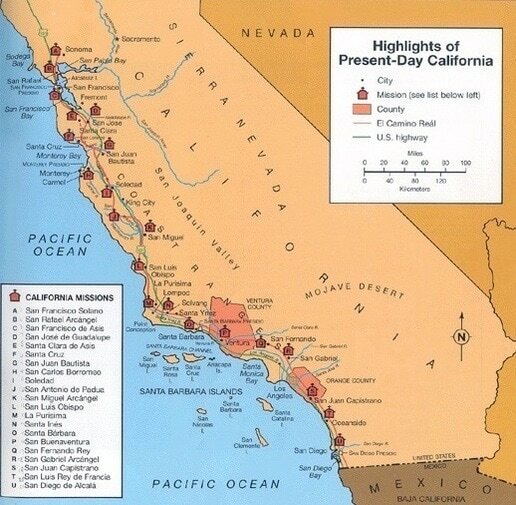 For many years, the civilized world thought that California was an island. That misconception comes from a 1510 Spanish romance novel that made the first known mention of "an island called California." 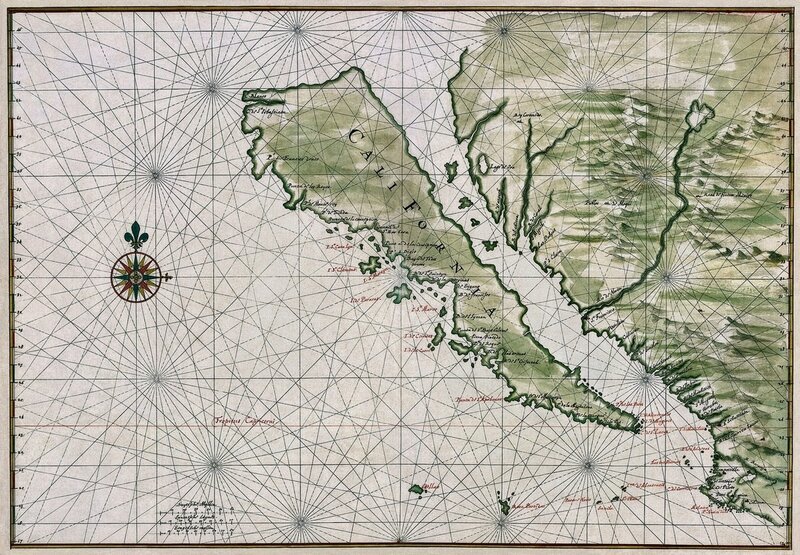 It was to be found "on the right hand of the Indies" and "very close to the side of the Terrestrial Paradise," and it apparently led early Spanish explorers to wishfully assume that the body of land to the west of New Spain (Mexico) was the legendary island of California. They named California and called it an island even before circumventing it. In 1539, an expedition led by Spanish navigator Francisco de Ulloa had reached the head of the gulf and turned back, finding no path to the Pacific Ocean, which seemed to prove that the peninsula is not an island. Yet even cartographers had been so convinced that the peninsula was an island, that it took the Alarcon expedition to dispel that misconception one year later. 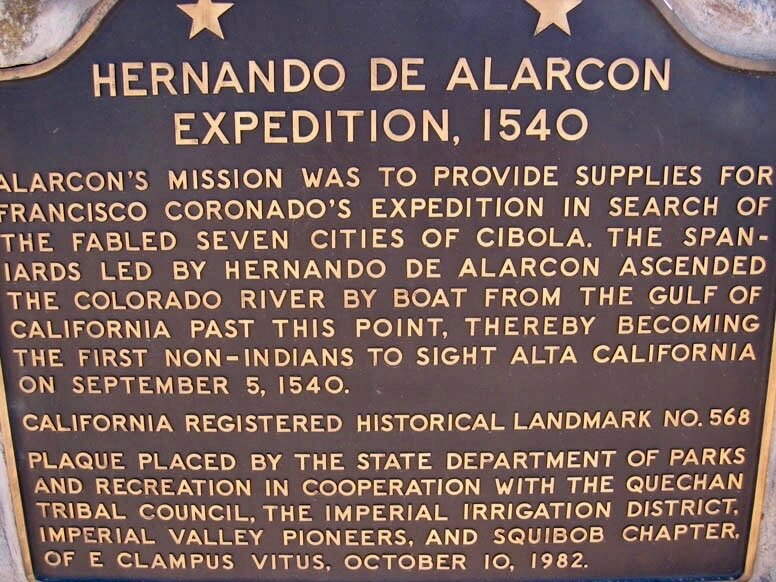 Today, the State of California recognizes Hernando de Alarcon with a roadside plaque, in Andrade, California, which notes that "The Spaniards led by Hernando de Alarcon ascended the Colorado River by boat from the Gulf of California, past this point, thereby becoming the first non-Indians to sight Alta California." Galveston: Still the Isle of Misfortune? 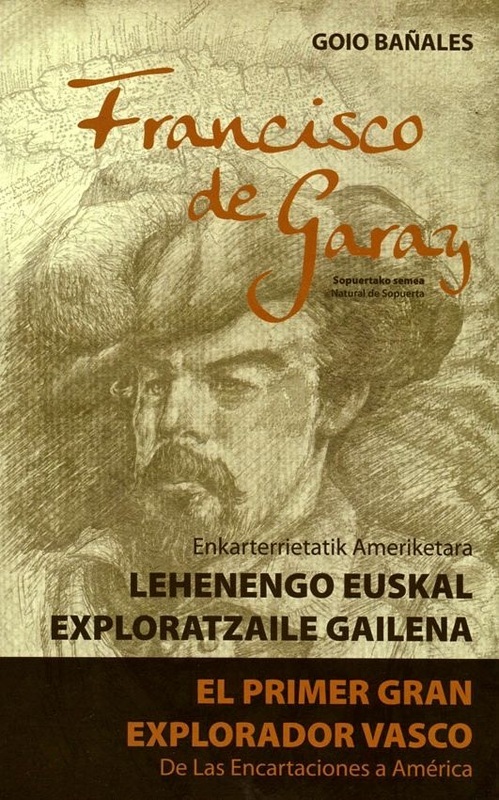 Alvar Nuñez Cabeza de Vaca, de vuelta en España, publica "La Relación", tal vez el primer libro de historia de América, cuenta historias sobre las personas, la flora y la fauna de la tierra que se convertiría en los Estados Unidos. 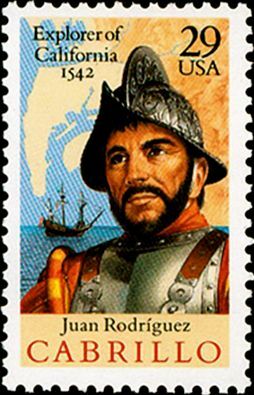 Juan Rodriguez Cabrillo, sails on from Navidad, Mexico on June 27, 1542 with three Spanish ships and lands on what is now San Diego Bay, which he named "San Miguel," on the 28th September. He explored the California coast claiming it for Spain and suffered a mortal fall on Catalina Island, CA, in January of 1543. 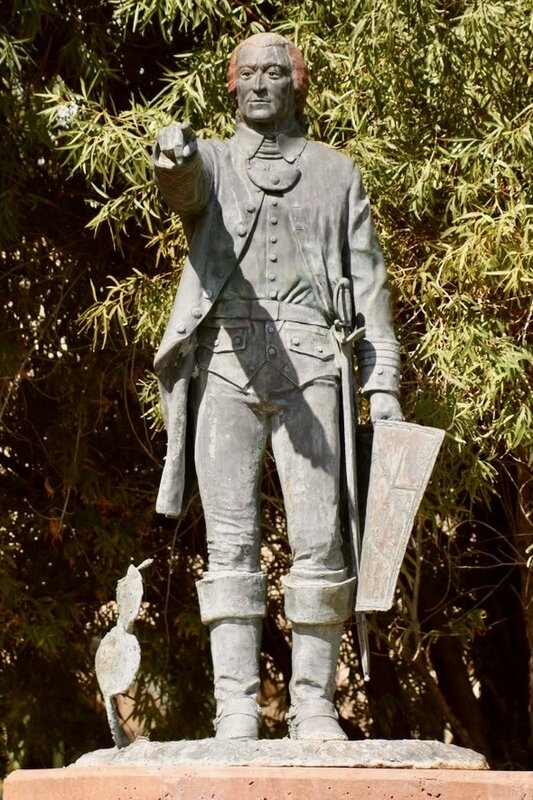 In his honor, the National Park Service operates Cabrillo National Monument, overlooking the bay from Point Loma in San Diego, commemorating his first landing in California. 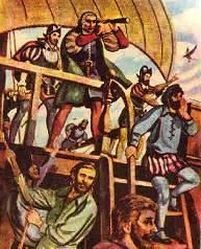 Juan Rodríguez Cabrillo, navega desde Navidad, México el 27 de junio 1542 con tres barcos españoles y desembarca en lo que hoy es la Bahía de San Diego, a la que llamó "San Miguel", el 28 de septiembre. Exploró la costa de California reclamándola para España y sufrió una caída mortal en la isla de Catalina, CA, en enero de 1543. En su honor, el Servicio de Parques Nacionales opera Cabrillo National Monument, con vistas a la bahía de Point Loma en San Diego, en conmemoración de su primer desembarque en California. 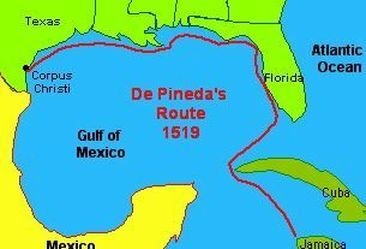 Tristan de Luna leads an 11-ship, 1,500-person expedition to settle Santa Maria de Ochuse in present-day Pensacola, Fl. Although the settlement was wiped out by a fierce hurricane shortly after it was established, Pensacola still calls itself "America's First Settlement." Tristán de Luna lidera una expedición de 11 buques, y 1500-persona para establecer Santa María de Ochuse en la actual Pensacola, Fl. Aunque el asentamiento fue arrasado por un huracán feroz poco después de su creación, Pensacola todavía se considera "el primer asentamiento de los Estados Unidos." 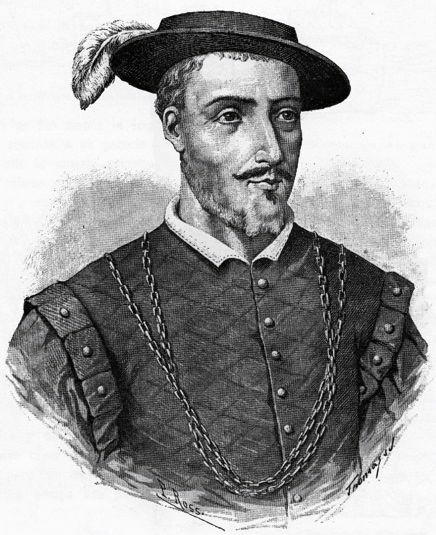 Spanish conquistador Pedro Menendez de Avilés establishes St. Augustine, the first successful settlement in Spanish Florida, and the city that is to become the oldest continuously inhabited European settlement in the continental United States. ​ He names the settlement "San Agustin" because 11 days earlier, on August 28, the feast of San Agustin, his fleet sighted the coast of Florida. To commemorate the town's foundation, on Sept. 28, they celebrate a Catholic Mass with the Timacua natives of the area. That ceremony is to be regarded as America's first Thanksgiving. Leading a fleet of several ships with some 1,000 sailors, soldiers and settlers, his mission is to survey the North American east coast, seek a suitable site to establish a permanent colony and drive away European intruders who could be encroaching on territory claimed by Spain. Yet shortly after sighting Florida, before exploring the coastline or seeking a settlement site, they find precisely what they had feared: French settlers secretly establishing a colony. It's part of France's effort to move into Spanish territory and contest Spain's claim of Florida. But it is as much a war between two competing European powers as it is a war between two religions. The Spanish are Catholics and the French are Huguenots (members of the French Reform Church) led by French naval officer Jean Ribault, who has led French efforts to establish a colony in the territory claimed by Spain. Unable to attack the French "Fort Caroline" (in present day Tallahassee, Fl.) 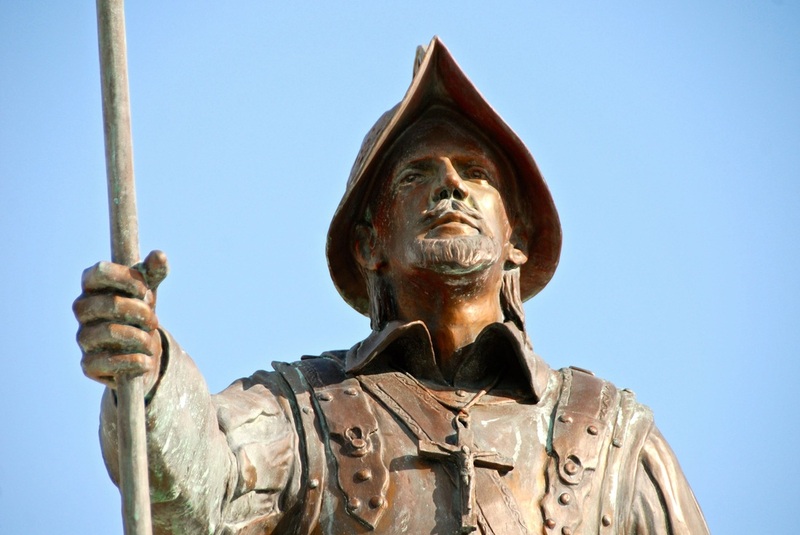 by sea, Menendez leads his fleet further south and establishes "San Agustin," in Northeast Florida -- in the same area where Juan Ponce de Leon's first landed when he discovered Florida in 1513. From San Agustin, Menendez leads an overland expedition, attacks and defeats Fort Caroline, and spares only the women and children. Spanish soldiers hang French bodies from the trees, with the inscription: "Not as Frenchmen, but as heretics." In the meantime, the French fleet led by Ribault is southbound on its way to attack St. Augustine. Yet, driven by hurricane winds, the French end up shipwrecked and marooned on the beaches south of St. Augustine, in an area that would be known as "Matanzas," because Menendez's forces catch up to them there and "slaughter" them. Menendez becomes the first governor of Florida and St. Augustine serves at the capital of Spanish Florida for more than 200 years. The city also served as the capital of British Florida during the 20-year period (1763-83) when "La Florida" was British, and then became Spanish again. 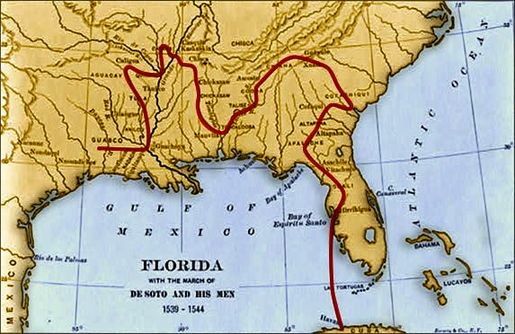 When Spain ceded Florida to the United States in 1821, St. Augustine remained the capital of the Florida Territory until 1824, when Tallahassee became the capital. Today, St. Augustine is the foremost Spanish colonial city in the United States, dotted by landmarks and monuments that attract tourists from all over the world. The Castillo de San Marcos, The Fountain of Youth Park, the colonial downtown, centered by a statue of Juan Ponce de Leon, and the Cathedral of St. Augustine could each be enough to draw many tourists. Yet in St. Austine, they are only part many more great attractions. 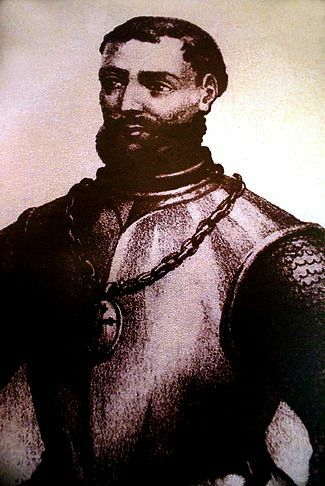 Pedro Menendez de Alvilés, the first governor of Spanish Florida, establishes Santa Elena, a Spanish settlement on what is now Parris Island, South Carolina. 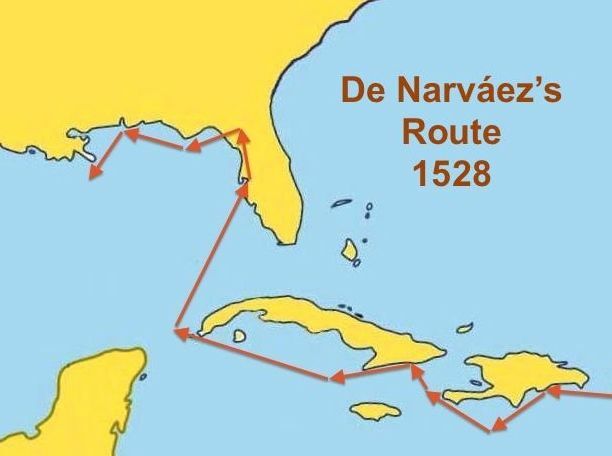 One year after establishing St. Augustine, Menendez expands the Spanish emprire northward, building Santa Elena at a site near an abandoned French outpost, Charlesfort, which was build by explorer Jean Ribault in 1562 and deserted one year later. At this time, Spanish Florida extends all the way north to the Carolinas, and Menendez makes Santa Elena the capital of Spanish Florida. Santa Elena becomes a sizeable community and the base of operations for Spanish Jesuit and military expansion. From Santa Elena, Menendez orders inland expeditions -- led by Captain Juan Pardo -- to the interior of what is now South Carolina, North Carolina and Tennessee. Pardo's mission is to pacify and convert the natives to Catholicism, and to discourage the creation of French colonies in this area. 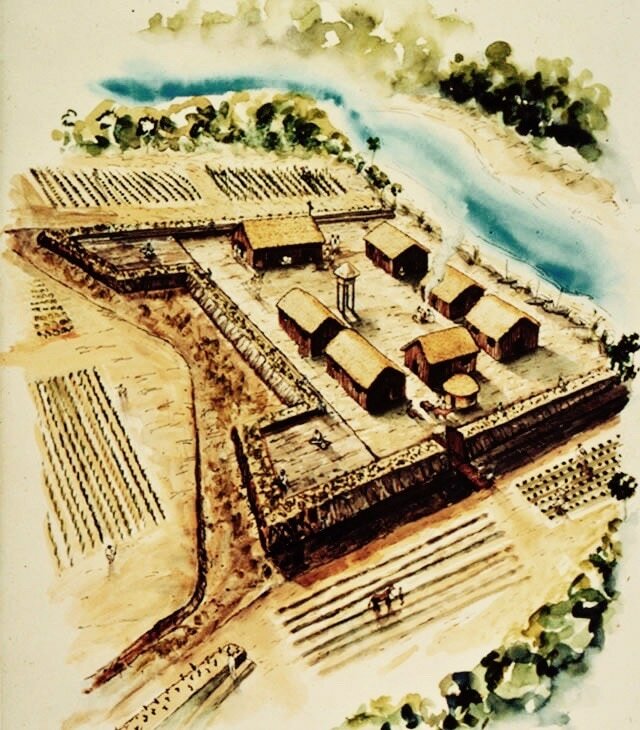 Pardo's first expedition reaches Joara, the great Native American regional center of Mississippian culture near present-day Morganton, N.C. From 1566 to 1568, Pardo buids six forts in what is now South Carolina, North Carolina and Tennessee and leaves a small contingent of Spanish soldiers, and Jesuit missionaries, at each one. 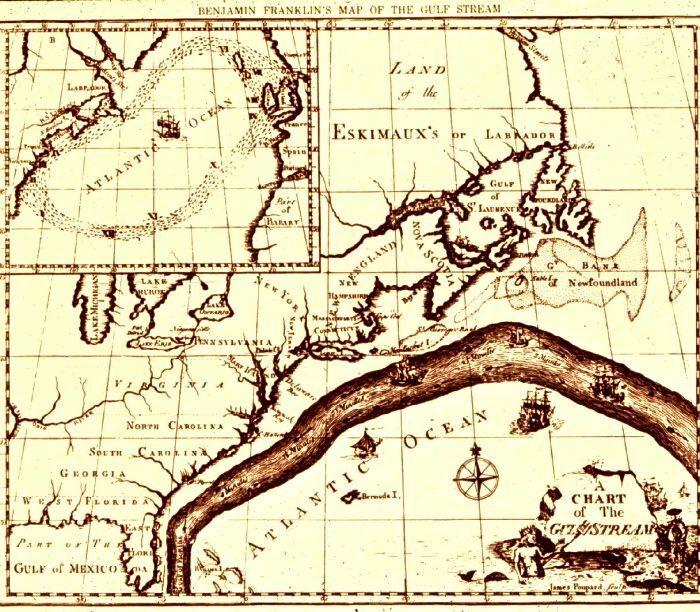 These are considered the first European settlements in the interior of North America. But the natives resist Spanish settlements. They attack and burn the forts, and within 18 months, kill all but one of the 120 soldiers and missionaries Pardo had left behind. This is the last time the Spanish try to imposed their colonial claim in the interior. In 1576, even Santa Elena is attacked and burned by the natives of nearby villages, and the Spanish are forced to abandon their forts -- San Felipe and San Salvador -- on the island. They return one year later, reestablish the settlement and build a new fort, San Marcos, which was able to repell an attack by 2,000 natives in 1580. Nevertheless, by 1587, the Spanish have lost interest in colonizing the Carolinas. They abandon Santa Elena and retreat to present-day Florida. Some of the native Escamacu people area, who had converted to Catholicism, kept their religion and Spanish rituals. The site of Santa Elena has not been fully reoccupied since Spanish left in 1587. In the past few decades, extensive archaeological excavations have been conducted at the Charlesport/Santa Elena site. Archaeologists have found many important clues about Spanish colonists in the 16th century. The found that Santa Elena had a series of colonial buildings around a central plaza. Today, Charlesfort-Santa Elena is a National Hispanic Landmark. Visitors to Parris Island can learn about the island's history at the nearby USMC Parris Island Museum, ﻿within the United States Marine Corps Recruit Depot on Parris Island in Port Royal, SC. The museum is open daily from 10 am to 4:30 pm, except for holidays. 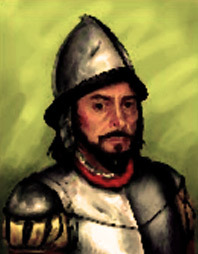 Juan de Oñate, a Spanish conquistador born in New Spain (present-day Mexico), leads a caravan of 129 soldiers, 10 Franciscan friars, some 300 settlers, 83 wagons and about 7,000 head of cattle, crosses the Rio Grande and claims New Mexico for the Spanish crown. 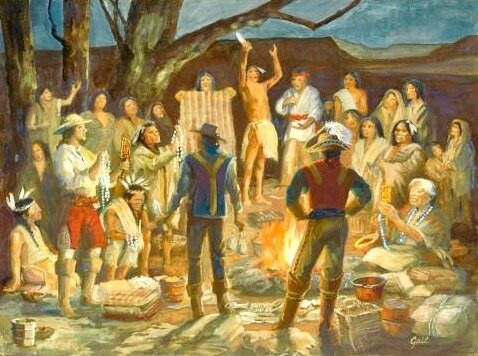 To celebrate the settlement of New Mexico, he hosts a mass and invites the natives to join him and his troops in a thanksgiving meal. Today New Mexico considers this to be the first American Thanksgiving. 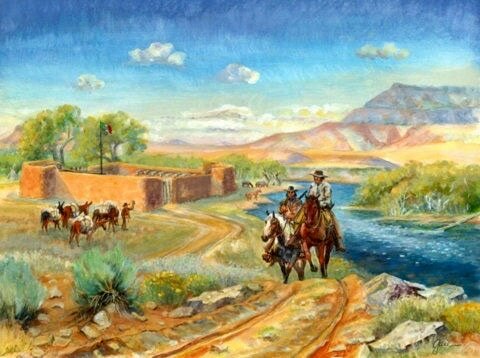 The expedition settles at the juncture of the Rio Grande and the Chama River and establishes “San Juan de los Caballeros” as the first capital of New Mexico. A year later, Oñate moves the capital to the west bank of Rio Grande and establishes "San Gabriel" (both are part of the present-day Ohkay Owingeh). 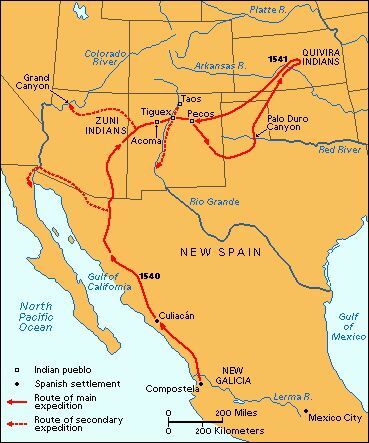 Later, as the colonial governor of Santa Fe de Nuevo Mexico, a province in the Viceroyalty of New Spain, he leads early Spanish expeditions to the Great Plains and the lower Colorado River Valley, encountering Native American pueblos, establishing Spanish administered settlements, and making enemies among the natives. 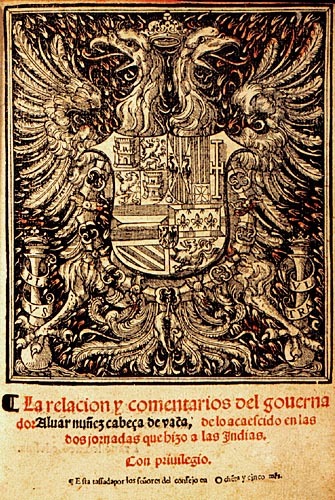 In 1607, Oñate is forced to resign as governor and returns to Mexico City to face the charges of maladministration. 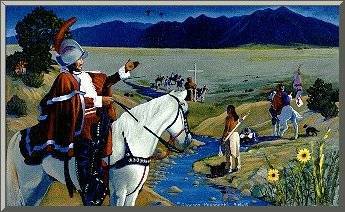 He is convicted of disobedience and mistreatment of both the natives and colonists, and is banished from New Mexico. He later travels to Spain where he dies. Today the site where San Gabriel once stood is considered a National Historic Landmark and is marked by a cross and memorial. In 2005 the people changed their pueblo name back to its their original, pre-Spanish name of Ohkay Owingeh. Today Ohkay Owingeh serves as the capital of the eight Northern Pueblos of New Mexico and is considered a federal Indian reservation. Nowadays, some people honor Oñate for his accomplishments as "the great colonizer" of New Mexico, while others vilify him for his cruelty to Native Americans. 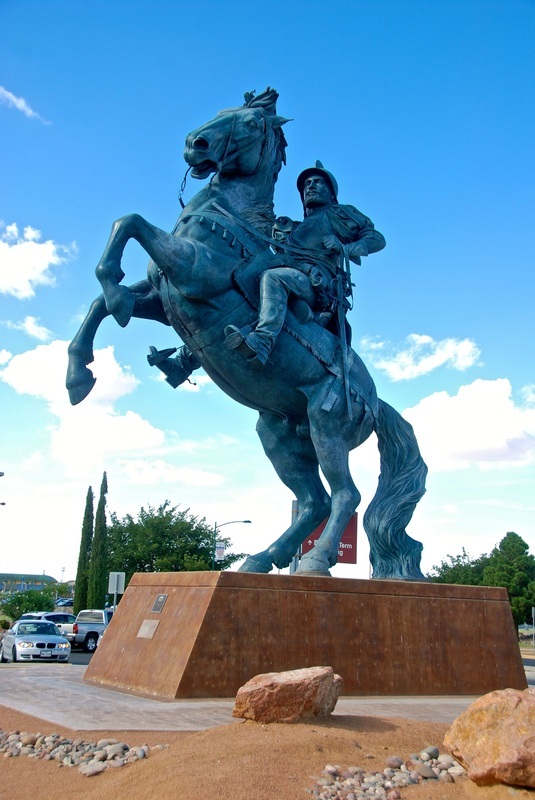 There are statues of him in Alcalde, New Mexico and El Paso, Texas. But since he was accused of punishing the Acoma natives by amputating their right feet, in 1998 as many were celebrating the 400th anniversary of his founding of New Mexico, someone cut off the statue’s right foot, and left a note: “Fair is fair.” In Texas, Native Americans pressured local politicians and, as a compromise, the planned statue of Oñate was renamed “The Equestrian” before it was even finished. Spanish explorer Sebastian Vizcaino sails north along the Pacific Coast from Acapulco to San Miguel, which he renames San Diego de Alcala -- now the city of San Diego, California. 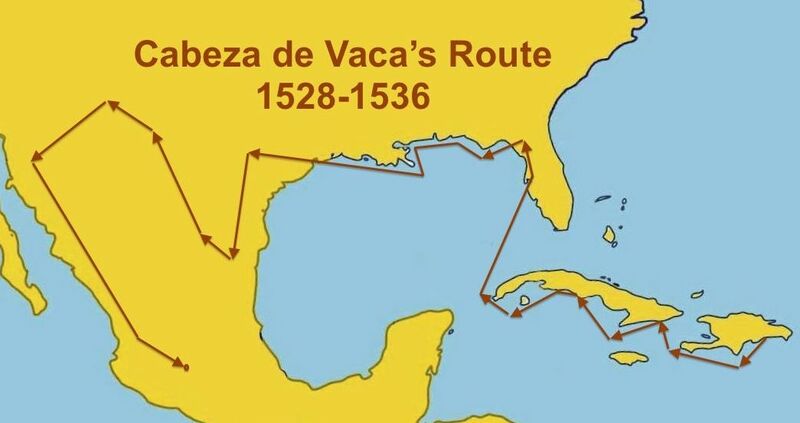 In search for new trade routes that would improve the economy of New Spain (Mexico), Vizcaino takes three ships -- The San Diego, The Santa Tomas, and The Tres Reyes -- with 200 soldiers and sailors, three Catholic friars and his 13-year-old son Juan. On his mission to expand Spain's northwestern trading frontier, he follows the shoreline first explored by Juan Rodriguez Cabrillo 60 years earlier. ​ But Vizcaino visits and names many California landmarks, including Monterey Bay, Santa Catalina Island, San Pedro, Santa Barbara, Point Conception, the Santa Lucia Mountains, Carmel Bay and the Carmel River. 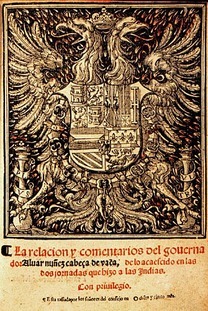 Before reaching present-day California, Vizcaino had taken possession of the Baja California peninsula and named it Nueva Andalucia. And after returning to Mexico, in 1611, Vizcaino went to Japan, where he led a Japanese delegation that charted and mapped the coastline. Today, the Royal Presidio Chapel, a National Historic landmark in Monterey, California, commemorates Vizcaino's landing at Monterey Bay. 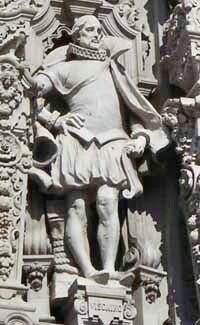 ​ Vizcaino's story is depicted on the facade of the California Building at Balboa Park in San Diego, California. Quotes from the diary of Vizcaino's journey are on a plaque in the McCoy House Museum, in the old town of San Diego State Historic Park. 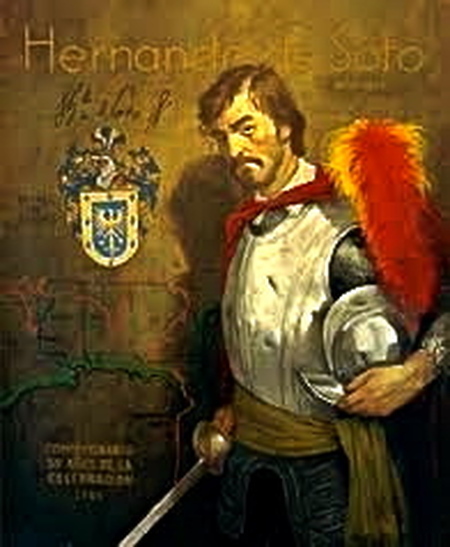 Spanish Army officer Don Pedro de Peralta, appointed second governor of New Mexico, arrives at its capital, La Villa de San Gabriel, and decides to move the capital to a new town. He establishes and names Santa Fe, New Mexico. 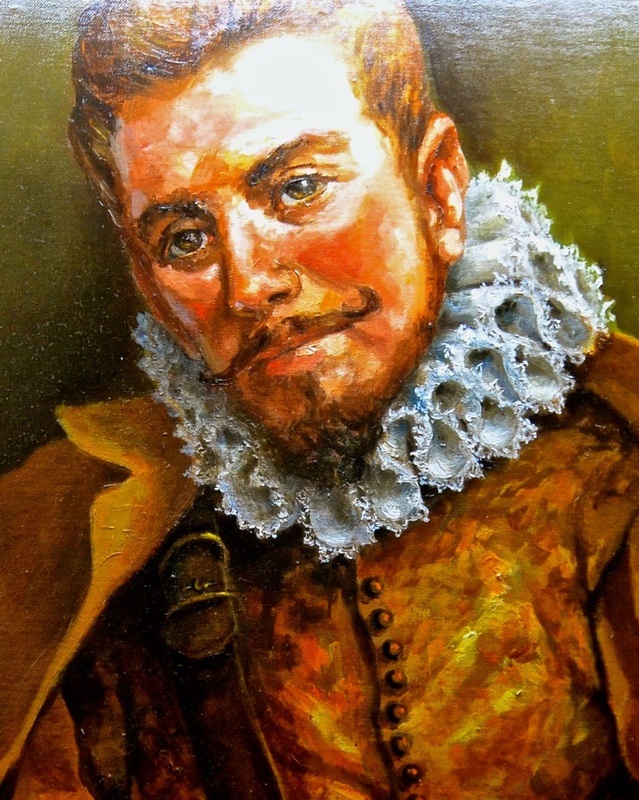 Replacing Governor Juan de Oñate, who had made many enemies among the natives, Peralta travels to New Mexico with only 12 soldiers and eight Franciscan priests, who are determined to convert the natives to Catholicism. 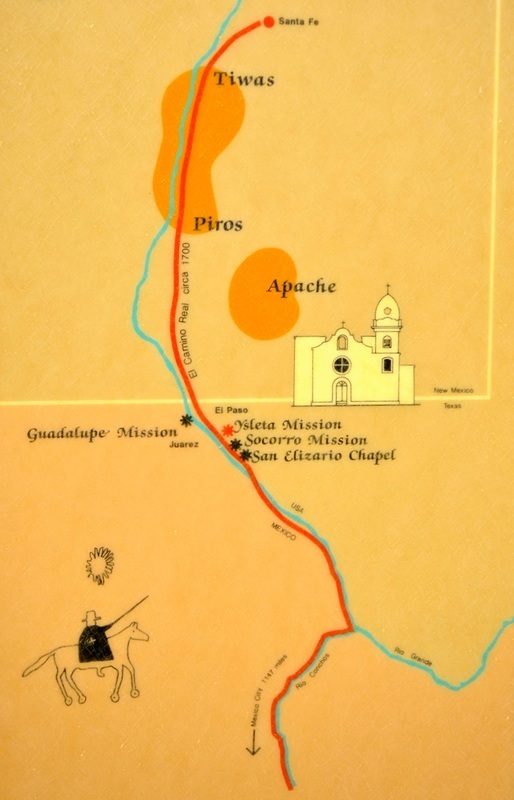 While the missionaries promise the natives that baptism would protect them from deceases, Peralta convinces some 200 San Gabriel settlers that the capital is erroneously located in an area that suffers drought, lacks fertile land, and is also too far from the Pueblo Indian population centers. Peralta selects an alternative site, with better land and a water good supply, and a surveyor designs the new settlement, which is separated by districts, home and garden plots, and including a downtown area, Santa Fe Plaza, for commerce and government buildings. 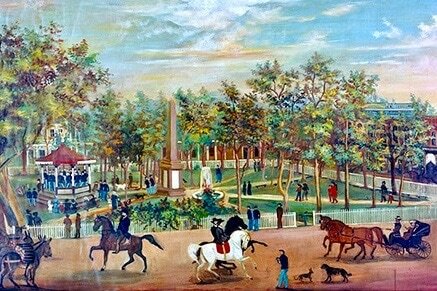 The Plaza is designed to hold "1,000 people, 5,000 head of sheep, 400 head of horses, and 300 head of cattle without crowding." It features a chapel, a jail, an arsenal, and the governor's headquarters and government offices, the Palace of the Governors, which is built with three-foot-thick adobe walls to protect Spanish authorities from native attacks. It goes on to serve as the New Mexico seat of government for centuries. 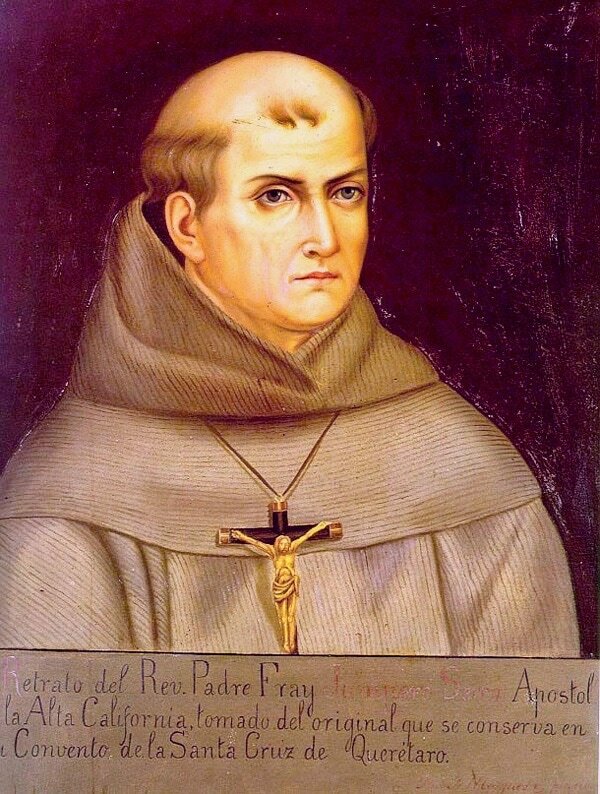 Three years after Peralta establishes Santa Fe, a Franciscan friar, Isidro Ordóñez, falsifies documents which give him as much power Peralta, accuses Peralta of mistreating the natives, has Peralta imprisoned and takes temporary control of the New Mexico government. After almost a year in prison, Peralta is allowed to return to Mexico City, where he explains his version of his dispute with Ordóñez and where he is finally vindicated by the Mexican Inquisition. 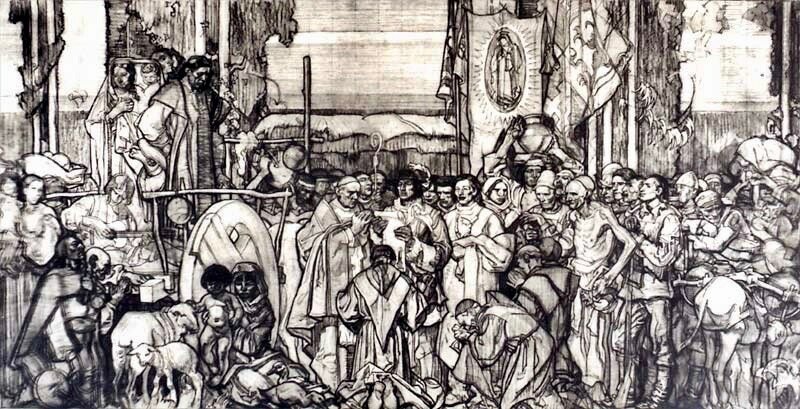 The Inquisition orders Ordóñez to return to Mexico City, and reprimands him. 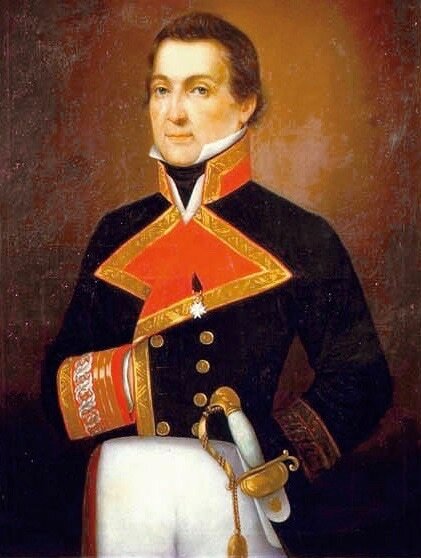 Peralta went on to serve on in various government post in Spanish America, from Mexico to Venezuela. 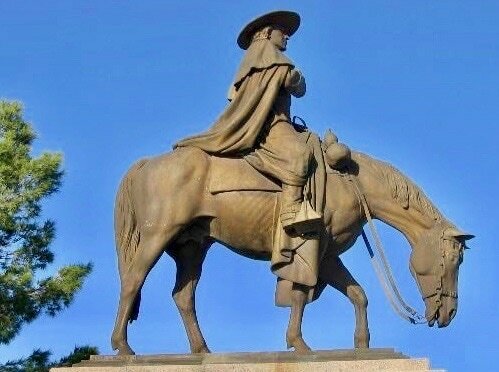 Today, Peralta rides a horse, with his surveyor standing next him, in a bronze statue called "The Founding of Santa Fe," in the city's Peralta Park. The Santa Fe Plaza is now the heart of downtown Santa Fe. The Palace of the Governors now houses the Museum of New Mexico and is considered to be the oldest continuously occupied public building in the United States. Both the Palace and the Plaza have been designated National Historic Landmarks. Juan Rodriguez, a native of the what is now the Dominican Republic, becomes the first immigrant in Manhattan. This is 12 years before Dutch colonists establish New Amsterdam, and 51 years before the English take control of the colony and rename it New York. 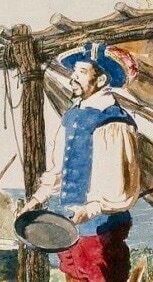 Born in Santo Domingo of a Portuguese sailor and an African woman, Rodriguez arrives on a Portuguese ship and decides to stay. He marries a Native American woman and establishes a family. He builds a very lucrative business, trading furs for European tools with the natives and the explorers who came to the New World. But he is not only the first immigrant. Rodriguez is also the first person of both European and African heritage to live in Manhattan. And he is not only the first Latino, he is the first New York Dominican! 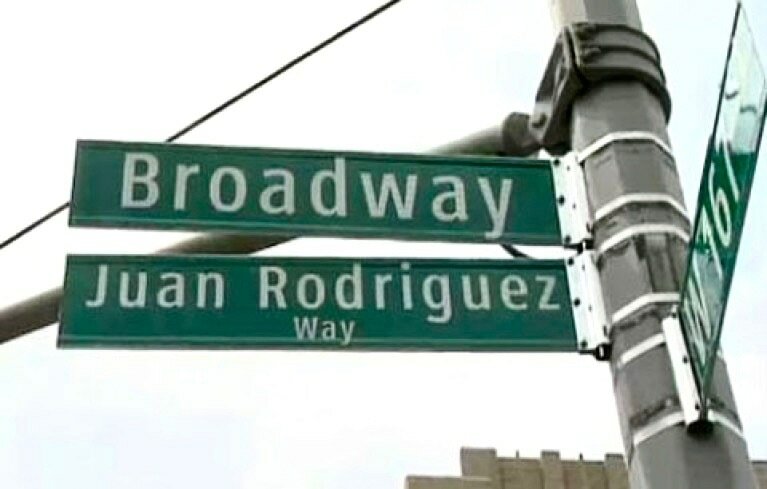 In 2012, New York City recognized him by co-naming a portion of Broadway, "Juan Rodriguez Way." In two predominantly Dominican neighborhoods, from 159th Street in Washington Heights to 218th Street in Inwood, many people now can look up an see streets signs recognizing that one of their ancestors arrived here first! 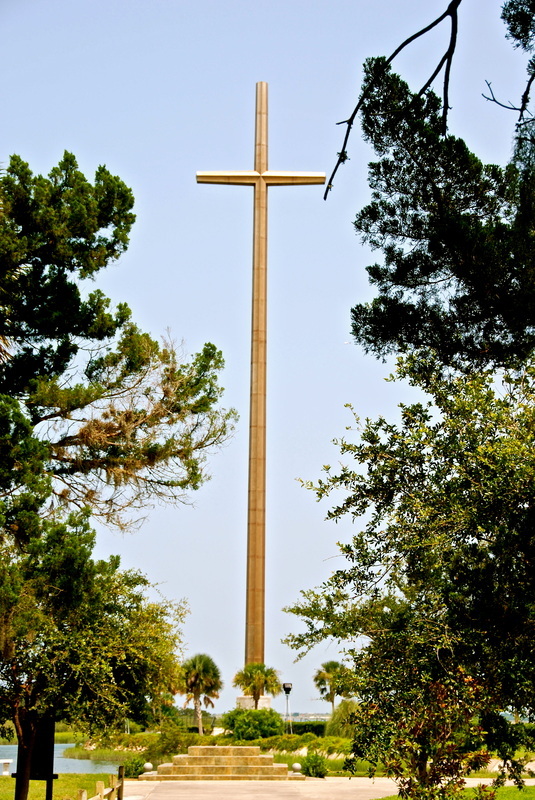 Misión San Luis de Apalachee is established by Franciscan friars Pedro Munoz and Francisco Martinez, in present-day Tallahassee, Florida, to covert the Apalachee Indians to Christianity and colonize the Florida Panhandle. Built in Anhaica, the capital village of the Apalachee Indians, the most powerful and advanced tribe in Florida, Mision San Luis becomes a community unlike any other in Florida, where Spaniards and Apalachees live and work together, and marry each other. Anhaica, the village first encountered by the Hernando de Soto expedition in 1539, is already a wealthy agricultural Apalachee community when San Luis is established. But the mission brings European knowhow and San Luis' crops are soon feeding soldiers and settlers in St. Augustine, the Spanish capital of Florida. In fact, when the mission is moved and expanded to a more secure location in 1656, the San Luis community has the largest number of European settlers in Florida, outside of St. Augustine. 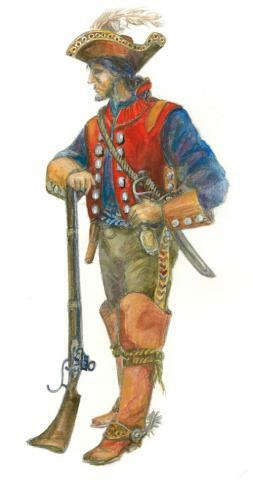 In 1656, when the Spanish government decides to built an outpost in northerwest Florida and encourages San Luis settlers to relocate the mission to a nearby, more defendable, hilltop location, the San Luis Spanish settlers and Apalachee Indians move the mission, build a church and fortified house (casa fuerte), and become a colonial community of some 1,400 people, including a powerful Apalachee chief and the Spanish deputy governor. But in 1704, following a series of raids by the English and Creek Indians, San Luis is evacuated and destroyed. 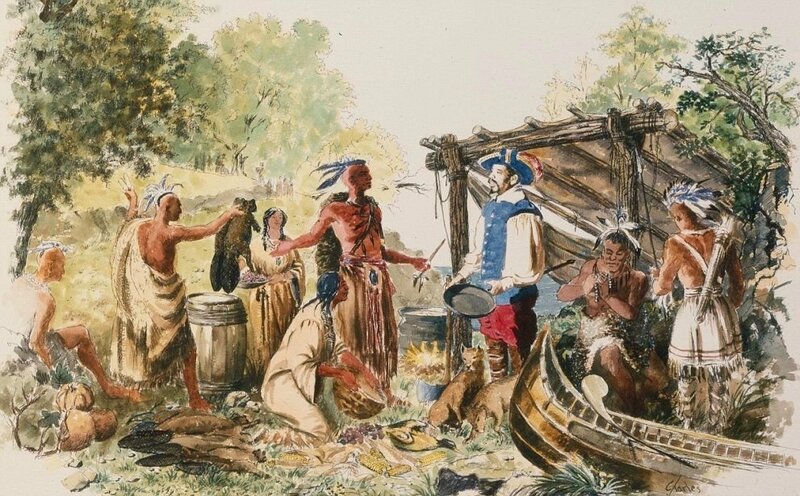 The Spanish and some of the Apalachees return to St. Augustine, and about 800 Apalachees flee west to Mobile, a French village where they settle for some time. Almost three centuries later, in 1996, the site where Mission San Luis stood was added to the U.S. National Registry of Historic Places. And in 1998, drawing from 15 years of historical and archaeological research, the rebuilding of San Luis begins. In 2000, the San Luis church celebrates its first Mass in almost 300 years. 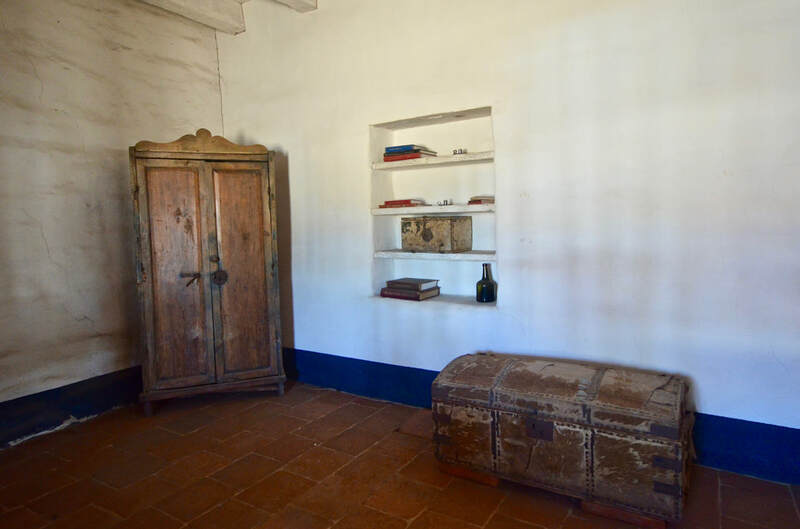 From 2000 to 2009, many other buildings are added to the reconstructed settlement, including a Convento, a Council House, the Chief's House, the fort "Castillo de San Luis," a Blockhouse, and a Typical Spanish House. Of more the 100 mission settlements established by Spain in Florida, San Luis is the only reconstructed mission in the state. This tourist attraction is made even more impressive by its "living historic interpreters" -- real people representing historic figures and recreating life at it was in San Luis in 1703. 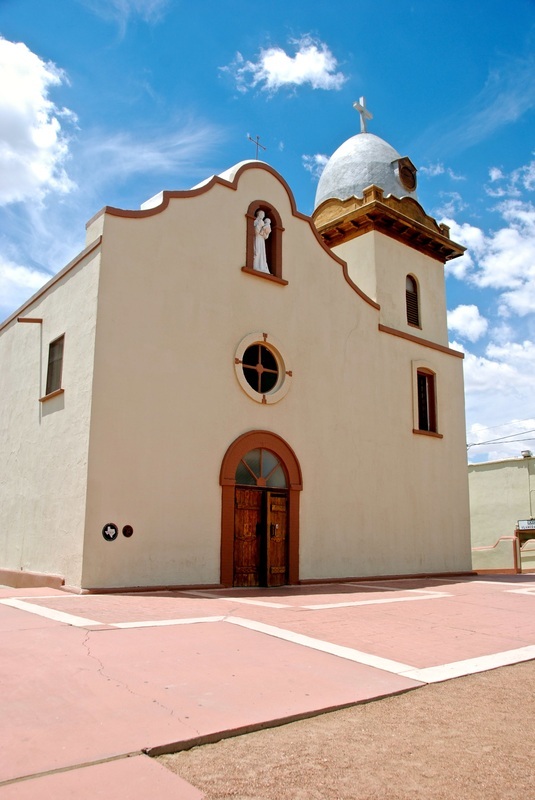 Copus Christi de San Antonio de la Ysleta del Sur, the first Spanish mission in present-day Texas, is established by Fray Francisco de Ayeta and Antonio de Otermin, the Spanish governor of New Mexico, in El Paso, Tx. 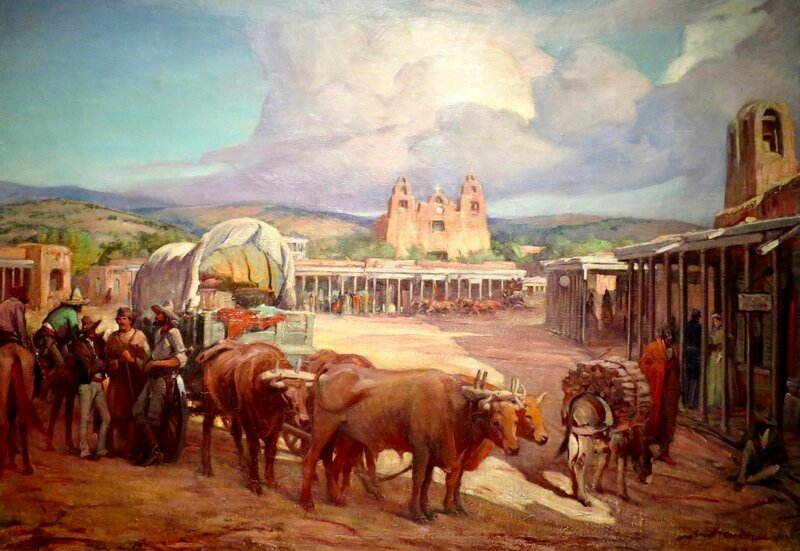 First used as a temporary refugee camp for Pueblo Indians who were fleeing from Apache raiders, the mission flourishes as an agricultural community, the first of several established by Spaniards and Native Americans near the Rio Grande. 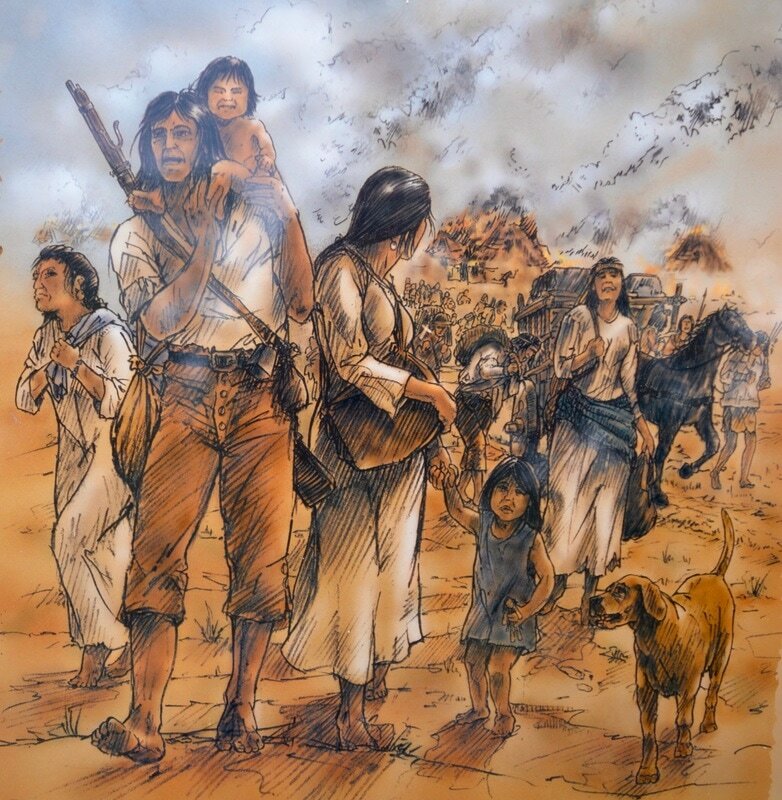 These were people who were return north to Texas after fleeing south from northern New Mexico during the Pueblo Revolt of 1680. Built with mud and chinked logs, the mission was was force to relocate several times due to fires and flooding of the Rio Grande, but the one of the original church bells still survives. 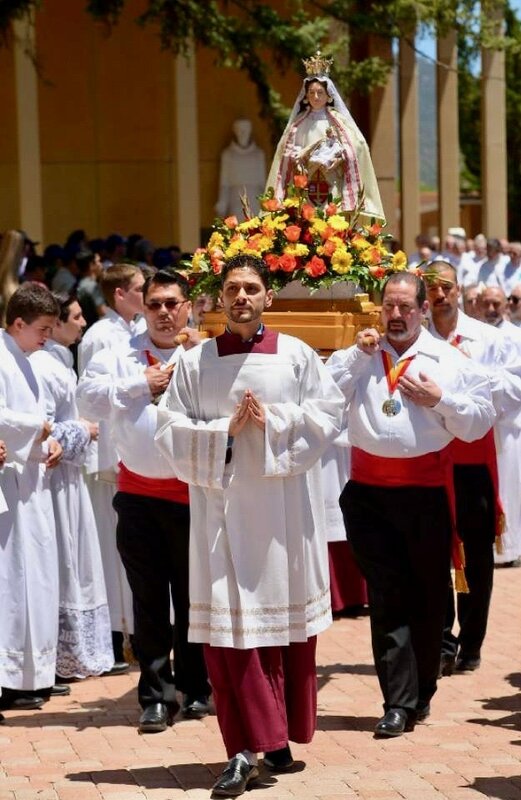 Father Eusebio Fransisco Kino, and Italian-born, Jesuit missionary and cartographer, establishes two Spanish missions on two consecutive days, in present-day southern Arizona, just six miles north of today's U.S.-Mexico border. 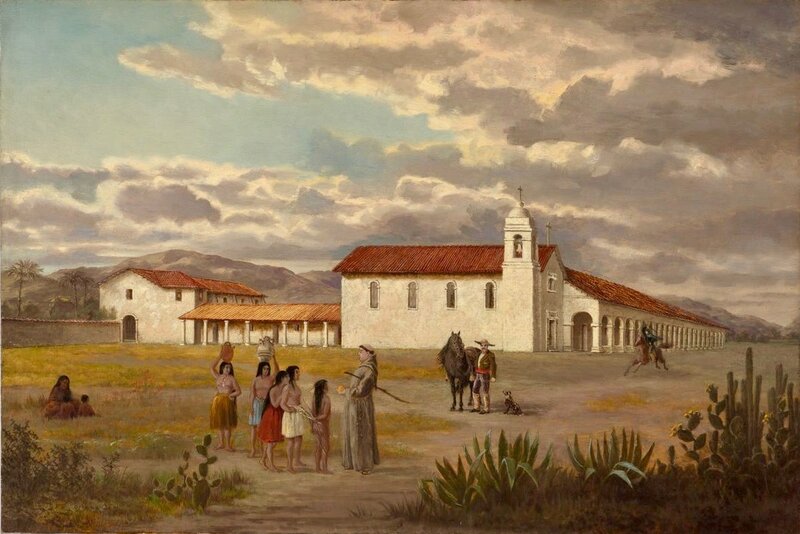 First comes La Misión San Cayetano de Tumacácori (years later replaced by Mission San José de Tumacácori). One day later, came La Misión de San Gabriel de Guevavi, which years later became known as Misión Los Santos Ángeles de Guevavi. Tumacácori and Guevavi are the first two of many more missions to be established by Father Kino, who is on a quest to convert the O'odham natives of the region to Chrsitianity. With time, the Tohono O'odham not only adopt the Catholic religion, but the Spanish language. Today, more than three centuries later, the decedents of the Tohono O'odham still speak their native pima language as well as Spanish. Today, both missions are part of the Tumacácori National Historical Park. The Mission San José de Tumacácori complex is open to the public. Nearby are the park's visitor center and the Tumacácori Museum. The Guevavi mission is not open to the general public, but can be visited on reserved tours led by park staff. 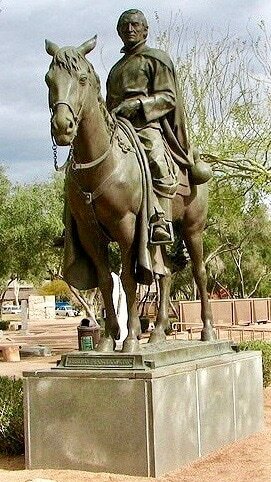 There are statues of Father Kino in Phoenix, Nogales, and Tucson, Arizona. 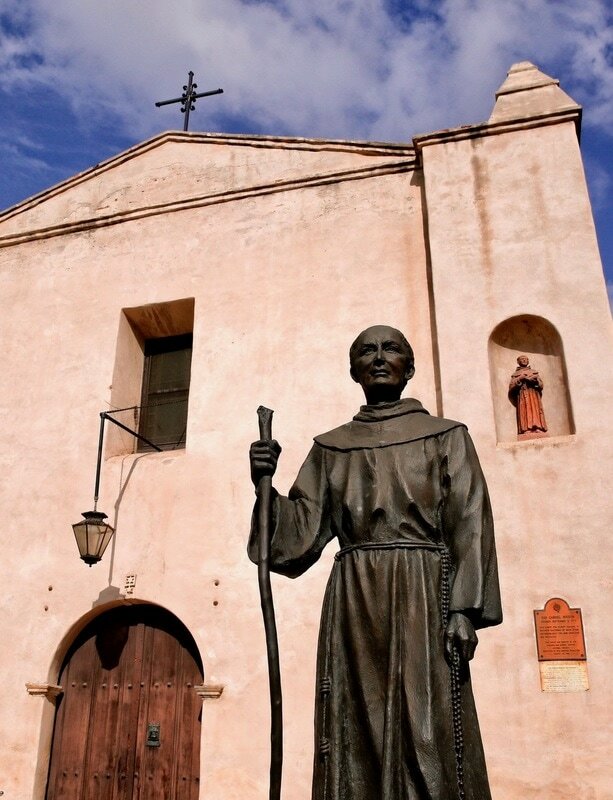 He also stands in a bronze statue in the National Statuary Hall in the U.S. Capitol, in Washington, D.C.
Father Eusebio Kino, an Italian-born Jesuit missionary and explorer, establishes the Spanish Catholic mission San Xavier del Bac in southern Arizona. On a mission to spread Christianity among the Tohono O'odham natives of the area, in the past year, Kino already has established two nearby missions, at Tumacácori and Guevavi, and now becomes the first non-Indian to visit the village of Bac. He already has established many other missions in present-day northern Mexico, and he goes on to establish more mission in Arizona. 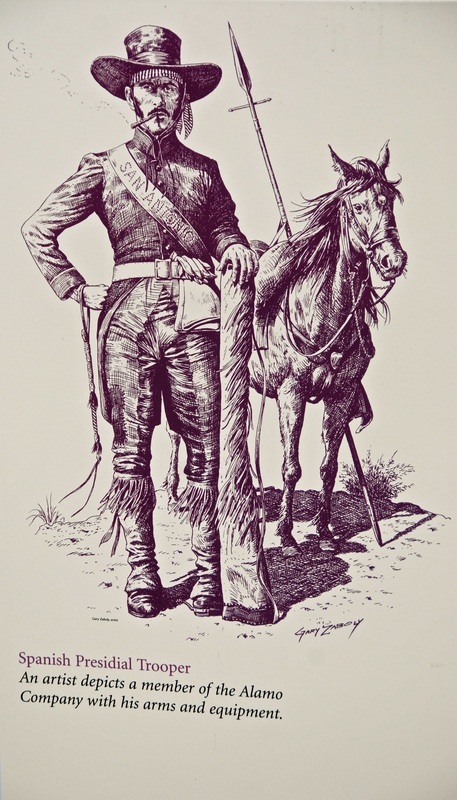 He also conducts several expeditions on horseback, covering and mapping more than 200 miles -- all along teaching the natives how to raise cattle and crops. 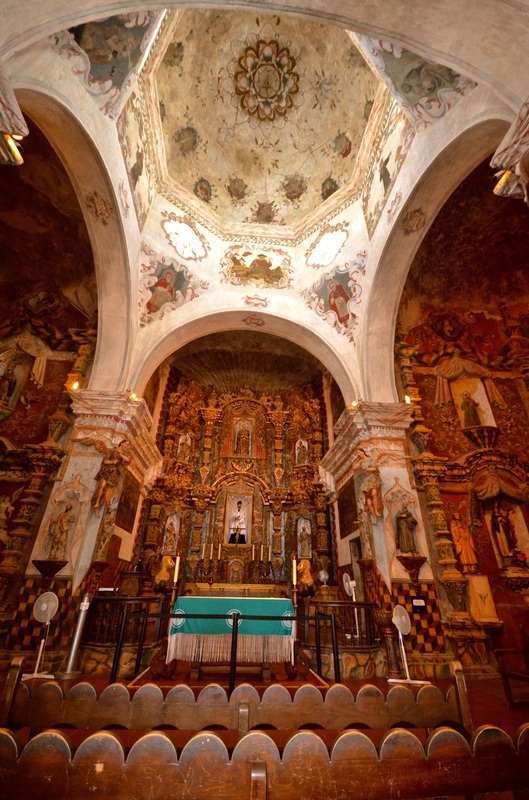 Kino's original San Xavier church is rebuilt from 1783 to 1797 -- 14 years! -- by Native Americans and Franciscan missionaries who have taken control of the mission. The church is known as "The White Dove of the Desert," because it appears that way when seen from a distance. With its combination of Moorish, Byzantine and late Mexico Renaissance architecture, and with its interior walls packed with numerous hand-carved and brightly painted wooden angels and saints, San Xaxier remains as perhaps the best example of mission construction in the U.S. It's one of the few places in the United States where you can step back in time by entering an authentic 18th-century space. 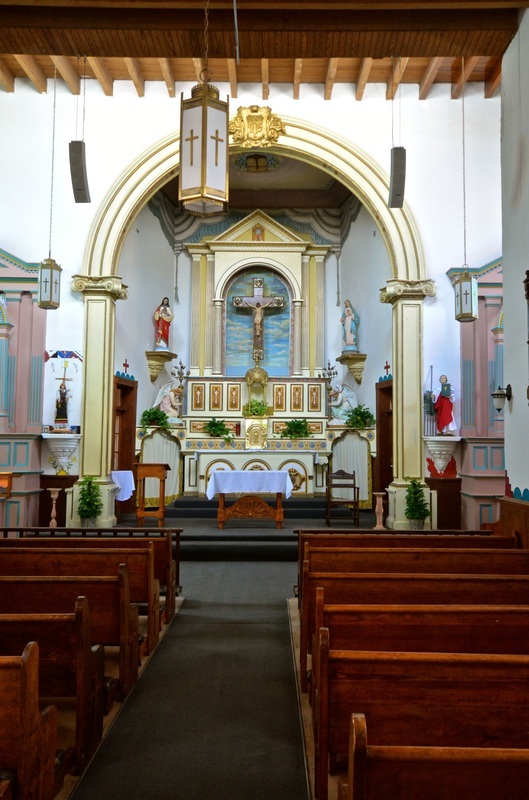 The church still serves the descendants of the Tohono O'odham natives Kino converted to Catholicism. 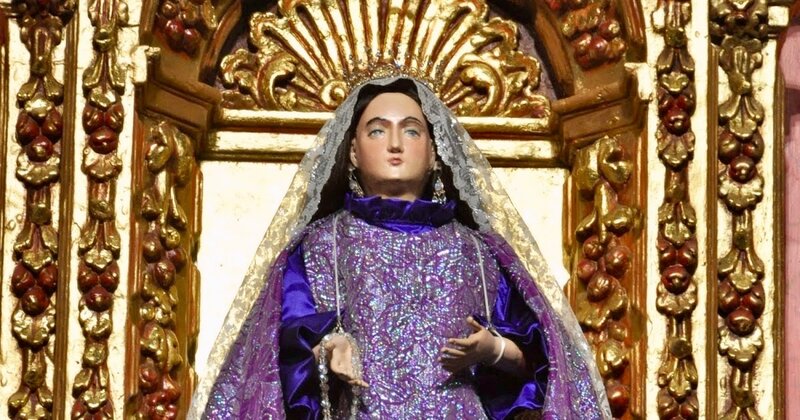 It also has become a place of pilgrimage for many people who go there to fulfill promises to the patron saint of the mission, San Francisco Xavier, another missionary who was one of the founders of the Jesuit order. Don Diego de Vargas, the Spanish Governor of New Mexico, leads a military expedition to reconquer Santa Fe and other territory that was taken by Native Americans during the Pueblo Revolt of 1680. Leading a 200-men army, he peacefully gains control over numerous pueblos without firing a single shot. Twelve years after the Pueblo people drove Spanish settlers out of New Mexico, and forced them to retreat to present-day northern Mexico and southern Texas, De Vargas conducts a "bloodless reconquest" that turns many former enemies into allies. He uses Catholic rituals to persuade the natives that he wants peace. But De Vargas' repossession of New Mexico doesn't remain peaceful. When some natives refuse to submit to his rule, he retaliates violently and in many ways, from cutting off their water supply to having 70 opposing Pueblo warriors executed. 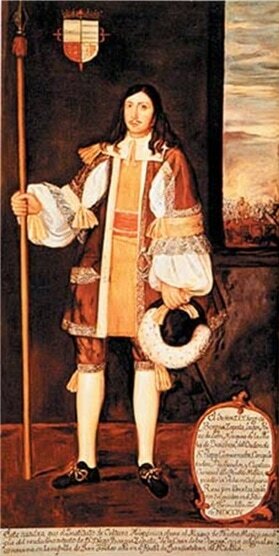 Many natives side with the Spanish, but violent skirmishes with rebelling natives continue until 1694. A devout follower of the Virgin Mary, De Vargas prays to her as "La Conquistadora" (The Conqueress). He believes that it was her who granted his initial peaceful re-entry into Santa Fe, and he celebrates a feast in her honor. That feast is still celebrated nowadays by the descendants of the reconquest, both Native Americans and Hispanics who come together to commemorate peace between the two groups. 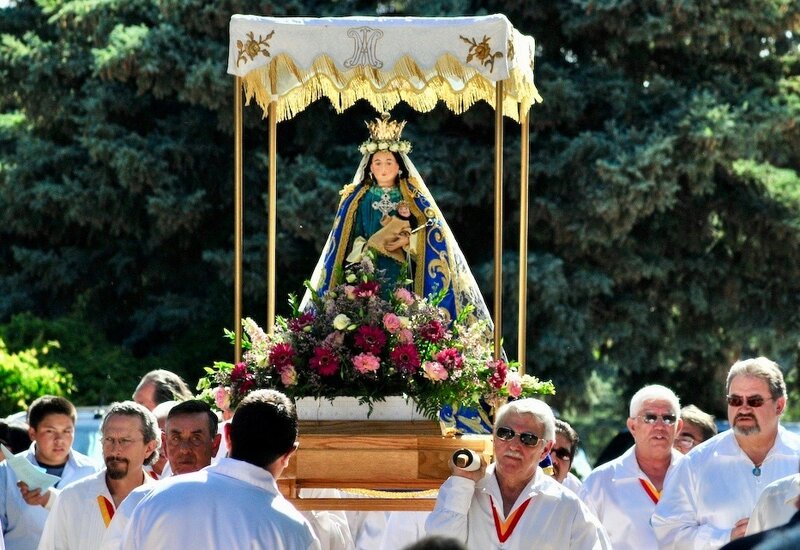 The city's annual "Fiestas de Santa Fe," is a novena of thanksgiving masses and a procession, usually in mid-September, carrying a wooden statue of La Conquistadora from her permanent home in the Cathedral Basilica of St. Francis of Assisi to the Rosario Chapel. 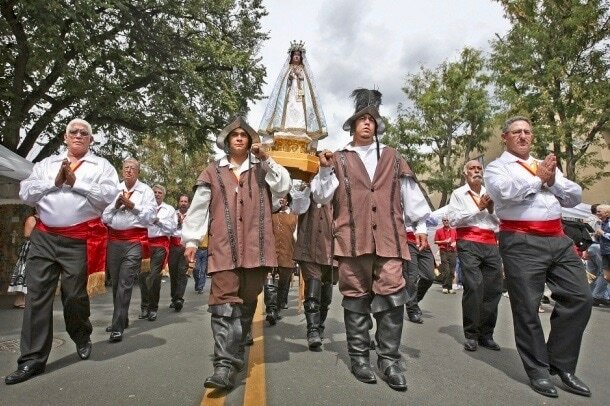 These "Fiestas de Santa Fe" are said to be the oldest civic and religious celebrations of their kind in North America. 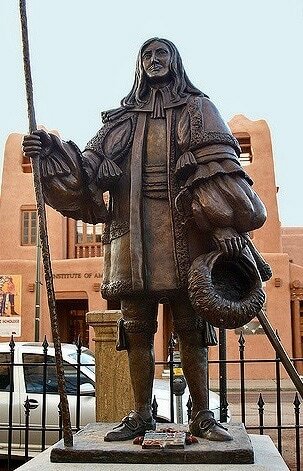 De Vargas is also recognized with a statue in Cathedral Park, adjoining the Basilica, in downtown Santa Fe. Workers brought from Havana, Cuba, complete the construction of Castillo de San Marcos, the stone colonial fort built to replace nine wooded fortifications that guarded St. Augustine, the Spanish capital of Florida, from British or pirate attacks. 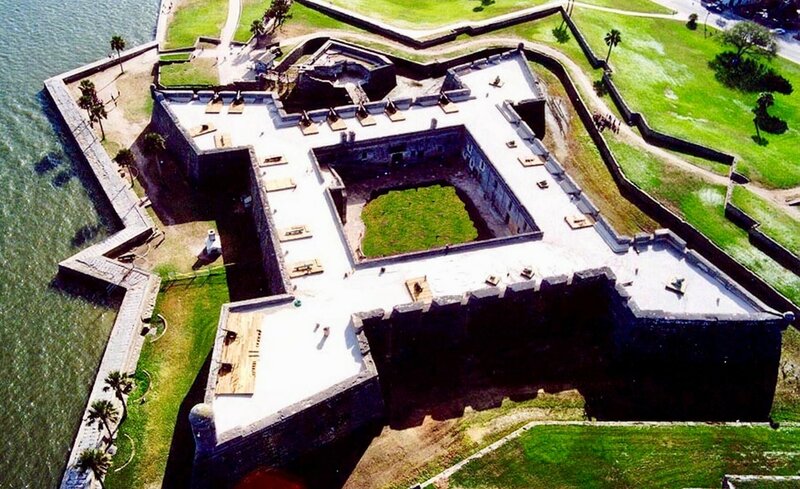 Guarding downtown St. Augustine, on the shoreline of Matanzas Bay, the impressive star-shaped fort, which took 23 years to build, is surrounded by a moat, fortified by powerful cannons, and divided into four bastions, named San Pedro, San Agustin, San Carlos and San Pablo. Made of "Coquina" (small seashells bonded together), which is similar to limestone, the powerful fort becomes an important New World military outpost for many years. 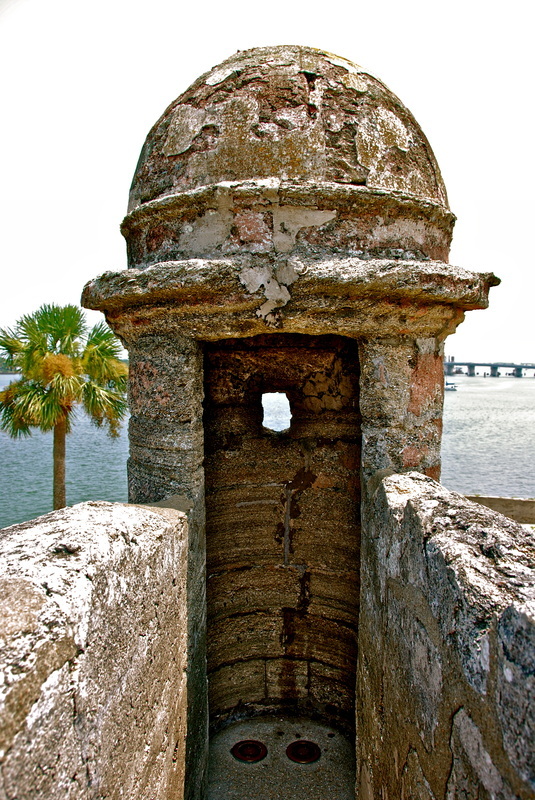 When the British Navy laid siege on St. Augustine in 1702, the Castillo sheltered the town's 1,500 residents and soldiers. In spite of a two-month battle, British cannons had little effect on the coquina walls. ​ Today, Castillo de San Marcos stands as the oldest masonry fort in the continental United States. A National Monument managed by the United States National Parks Service, the Castillo is the biggest tourist attraction in St. Augustine and a popular icon of representing centuries of Hispanic presence in North America. ​a Franciscan priest from Andalusia, Spain, treks north from New Spain into present-day Texas and establishes Mision San Antonio de Valero, the Spanish mission that is much better known as The Alamo. 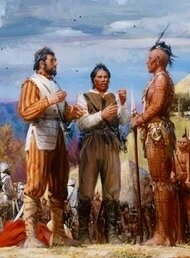 seeking to covert Native Americans to Catholicism and to colonize northern New Spain. After relocating twice until settling at its present site in 1724, just across the river for the town of San Antonio de Bexar -- today's City of San Antonio, Tx. -- the mission becomes self-sufficient, with its own church, granary, living quarters, workshops, fields, and pastures. But in 1836, when it was no longer used as a Spanish mission, it becomes the site of the most famous battle of the Texas Revolution. After the mission was closed in 1793, the buildings kept changing hands and functions, serving as a meeting place, a hospital and finally a military fort that had become known as "The Alamo." Occupied by rebels who fought and died for Texas independence from Mexico -- including many Hispanics -- the Alamo suffered a defeat against the Mexican Army that become legendary. "Remember the Alamo" became the battle cry that eventually won Texas independence from Mexico. 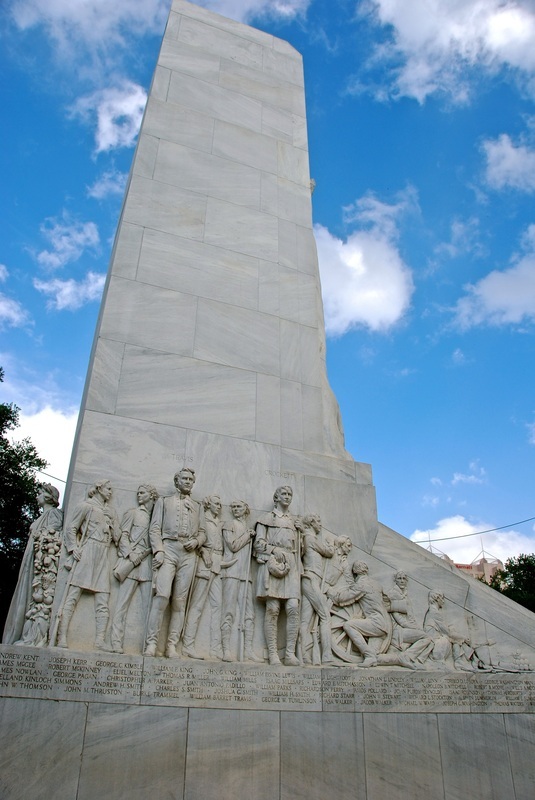 Of the estimated 189 men who died defending The Alamo, only six were actually born in Texas -- and all of them were Hispanic: Juan Abamillo, Juan A. Badillo, Carlos Espalier, Gregorio Esparza, Antonio Fuentes, and Andrés Nava. 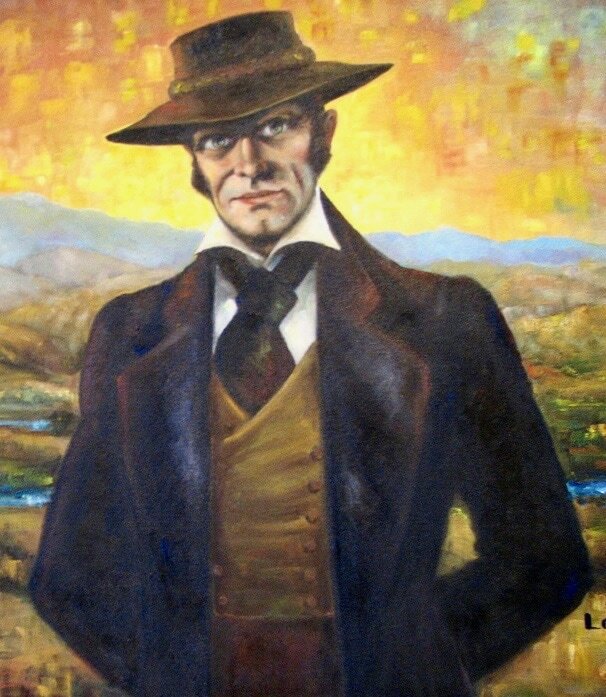 And the man who left The Alamo to seek reinforcements, Juan Seguín, was also a Latino. Nowadays, they are all recognized in a monument outside the mission. And The Alamo is San Antonio's biggest tourist attraction, celebrating both its heritage as a Spanish mission and as the sacred battleground of the Texas Revolution. ​The Spanish government in Florida officially grants unconditional freedom to all runaway slaves from British plantations in South Carolina. 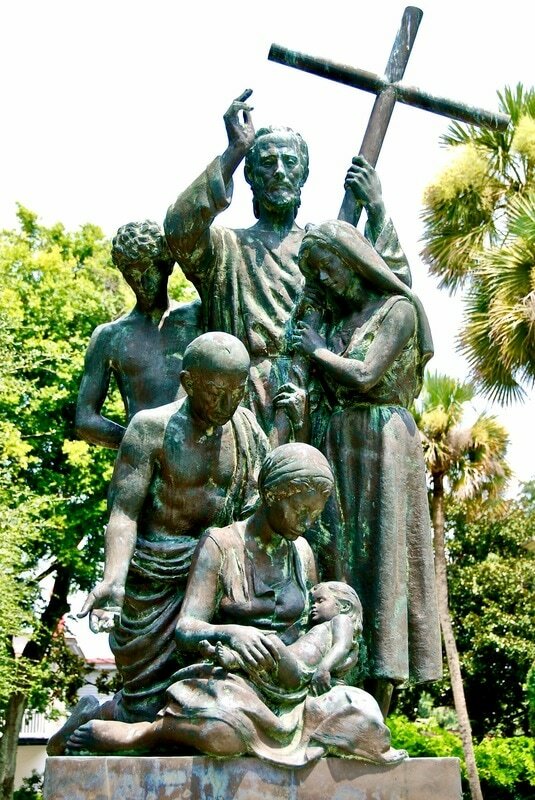 It started 50 years earlier, in 1688, when eight men, two women and a three-year-old girl escaped slavery on a stolen raft and were given sanctuary in St. Augustine by the Spanish Governor of Florida, Diego de Quiroga - once they converted to Roman Catholicism. The two women worked as domestic helpers in the Governor's home. Two of the men were employed as blacksmiths, and the other six worked on the construction of Castillo de San Marcos. They were all paid for their labor. In spite of efforts by British slave owners to regain their property, de Quiroga resisted, and protected them. But they were only the first. 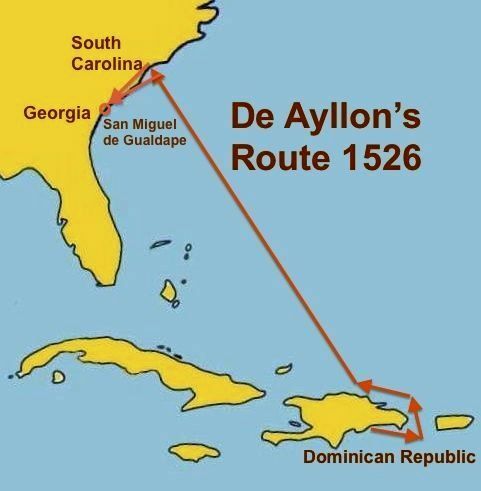 Spanish records show that at least six separate groups of runaway British slaves escaped from South Carolina to St. Augustine, the capital of Spanish Florida, between 1688 and 1725. And in 1726, another Florida governor, Antonio de Benavides, created a black Spanish militia to defend St. Augustine from British attacks. 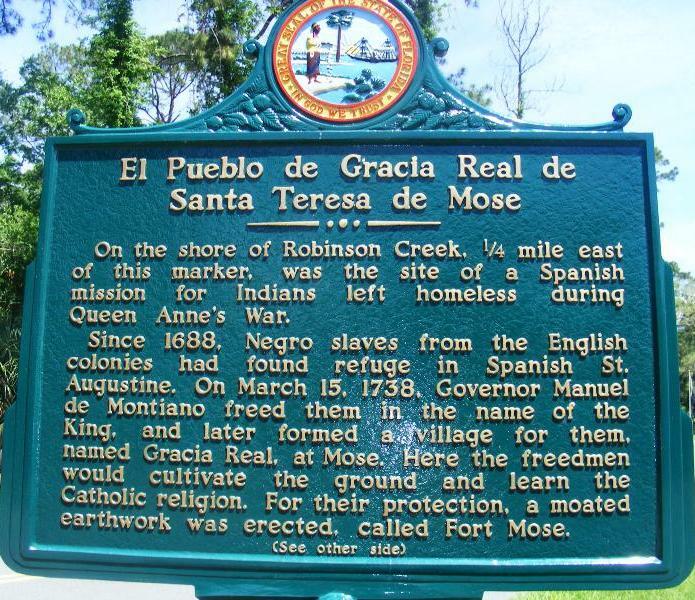 In 1738, yet another Spanish governor, Manuel d Montiano, makes their freedom official, appoints the black militia captain to build and command a fort, and establishes "Gracia Real de Santa Teresa de Mose" - better known as "Fort Mose" - for freed African slaves. 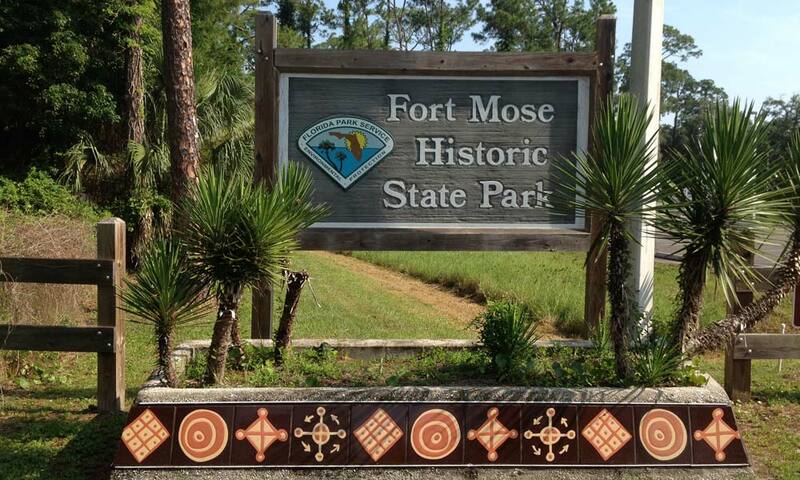 They form the first free African-American community in what is now the U.S.A.
Today, the first African-American settlement is recognized at the Fort Mose State Park, two miles north of St. Augustine, Florida. Spanish soldiers open Fort Matanzas on the east coast of Florida, 15 miles south of St. Augustine, to protect the city from attacks by way of the Matanzas Inlet and the Matanzas River. It is meant to reinforce the city's southern flank and to supplement the security already provided by Castillo de San Marcos, the city's imposing waterfront fort. 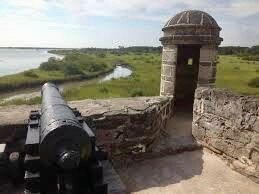 Guarding the Matanzas Inlet, which leads to the Matanzas River and the southern waterway entrance to the city, Fort Matanzas adds considerable security, since it allows Spanish soldiers to observe approaching enemy vessels before they can reach St. Augustine. It also serves as rest stop, coast guard station, and a place where friendly vessels heading for St. Augustine get advice on navigating the river. 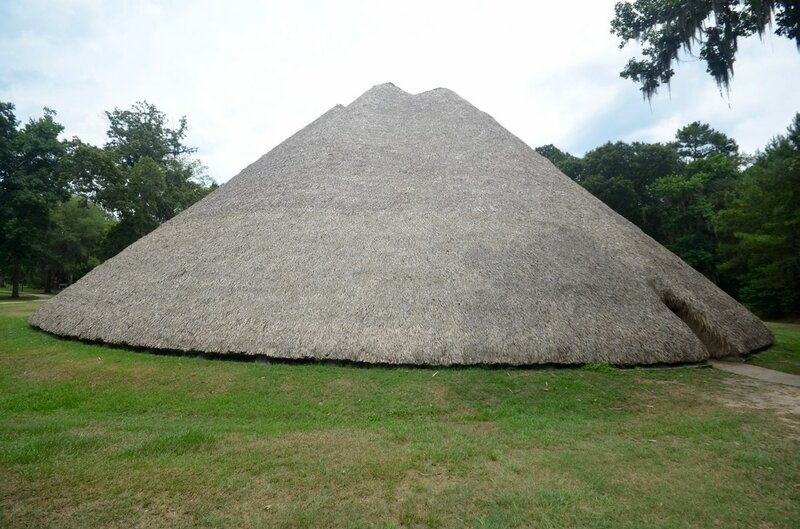 This small, square, supplemental fort -- 300 feet high and 50 feet long on each side -- took two years to build, and it is made of the same coquina shell-stones that were used to build Castillo de San Marcos. 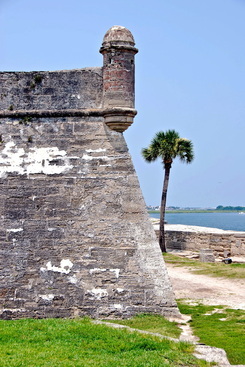 It has five cannons guarding the southern waterway entrance to St. Augustine. It is manned by a garrison of one officer in charge, four infantrymen, and two gunners, who serve on rotation from their regular duty in St. Augustine. 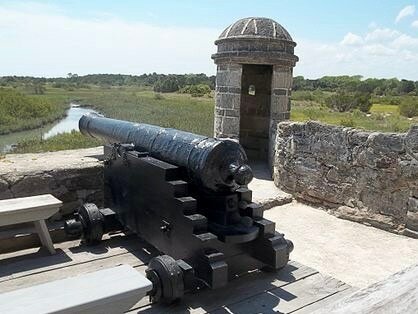 When Fort Matanzas is challenged, close to completion, by 12 approaching British ships, its cannons force the fleet to retreat without reaching St. Augustine. It is the only time the fort fires cannons against an enemy. The word "Matanzas" (slaughter) refers to a conflict that occurred in that area almost 200 year before Fort Matanzas was constructed. 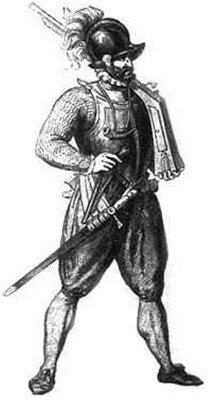 In a war over Florida territory and religions -- Catholics against Protestants -- and in a raid commanded by Pedro Menendez de Aviles, founder of St. Augustine, some 250 French soldiers and settlers had been "slaughtered" there in 1565, giving the name "Matanzas" to the inlet, the river and then the fort. 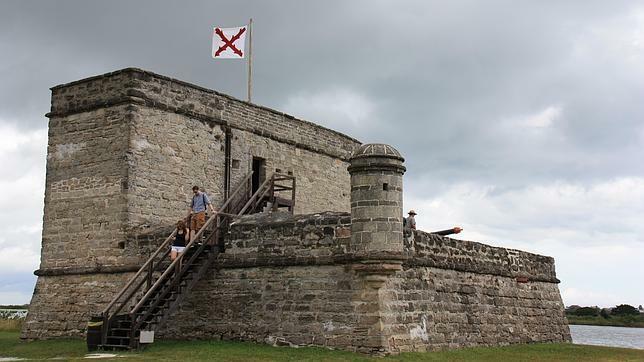 Today, Fort Matanzas stands as a testament to the Spanish Empire's determination to protect its territorial claims for control of the New World against the French and British. 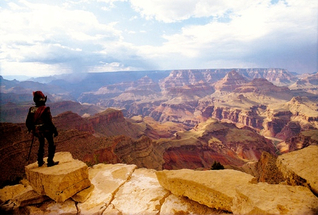 It was declared a National Monument on October 15, 1924. It is now managed by the National Parks Service, in conjunction with Castillo de San Marcos. 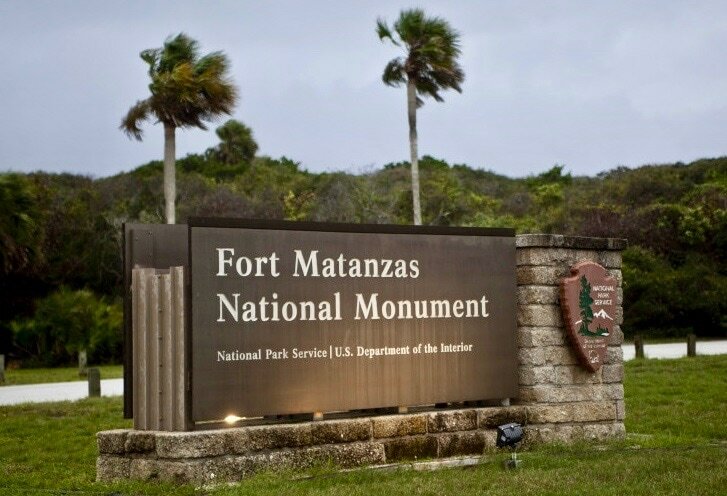 Fort Matanzas is normally, open to the public, by way of a ferry, from 9:00 a.m. to 5:30 p.m. everyday except on Thanksgiving and Christmas. However, due to damage to the ferry dock and beach boardwalks caused by Hurricane Matthew, ferry access is temporarily closed. The Presidio of San Ignacio de Tubac, also known as Fort Tubac, is built by Spanish soldiers, becoming the first Spanish colonial garrison in what is now southern Arizona, and the foundation for the Village of Tubac. It is built to protect the Spanish missions of the valley of the Santa Cruz River and the Spanish colonists who have settled, since the 1730s, in the area of Tubac, a small Pima Indian village. One year after a Pima uprising destroyed the Spanish settlements, the Pimas surrender and the fort is build to prevent further rebellion. 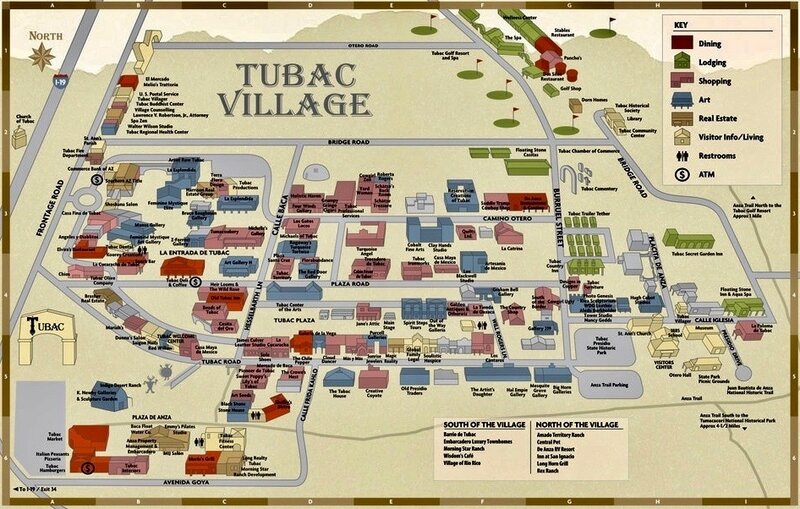 Tubac becomes the first European settlement in what is now the state of Arizona. Tubac also becomes one of the key stops on the Camino Real (the Spanish colonial trail) from Mexico to the Spanish settlements in California and the site of many battles from the Apache-Mexico Wars to the American Civil War. Today, the Tubac Presidio State Historic Park, adjoining the Village of Tubac, preserves the Presidio's ruins. The park features several historic sites, a museum, and an underground archeology exhibit displaying the excavated foundations of the Tubac Presidio. It also features living history presentations, on Sundays from October through March. The park also marks the Trailhead of the Juan Buatista de Anza 1774 expedition from southern Arizona to northern California. Although it is Arizona's first state park, and the word "state" still is part of its name, due to budget cutbacks, the park is no longer operated by the Arizona parks system. If fact, the park would have been closed in 2010, had it not been saved by dedicated volunteers, The Friends of the Presidio, who now operated the facility. Spain trades Florida to England in exchange for Cuba. 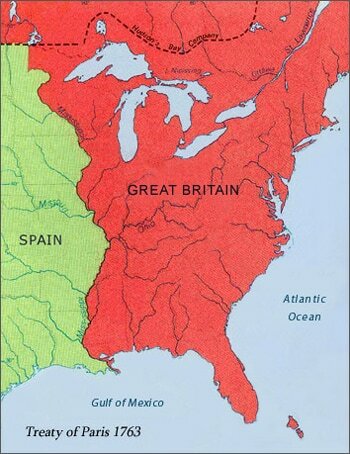 As a result of the Seven Years (French-Indian) War, in which Great Britain defeated France and Spain, England gets all French territory east of the Mississippi River, except for New Orleans. And Spain gives up East and West Florida to the British in return for Cuba, which Spain had lost during Seven Years War. This is all the result of the Treaty of Paris of 1763, which ends the long, bloody war and sets the Florida peninsula on a totally different course. 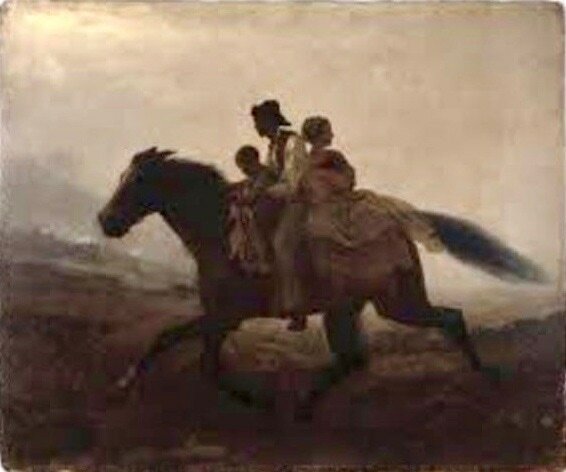 More than two decades after the Spanish government in Florida had granted unconditional freedom to all runaway slaves from the British plantations in South Carolina, Britain imports thousands of new slaves from Africa, and from other British colonies, to Florida. Yet, because England had gone into debt to fight the Seven Year War, and because it was forced to imposed heavy taxes on its North American colonies, the Treaty of Paris May have triggered the American Revolutionary War against Britain a few years later. 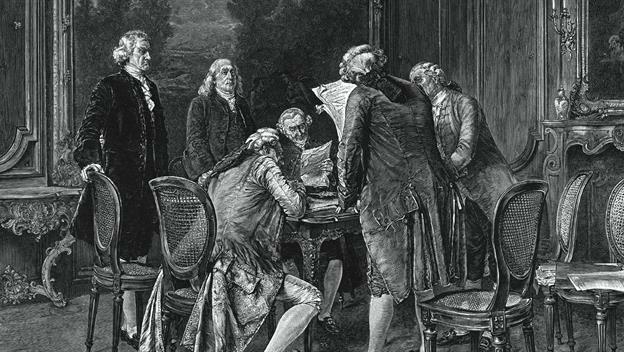 Twenty years later, it took another Treaty of Paris -- in 1783 -- to return Florida to Spain. 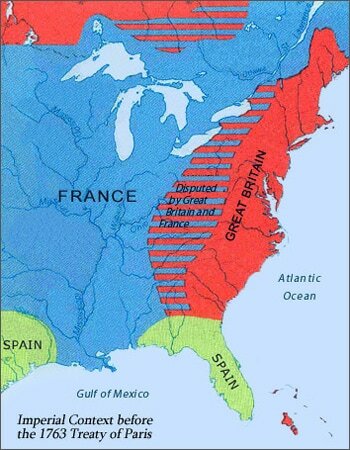 This second Treaty of Paris brings an end to the American Revolution, after the Americans colonies defeated the British with the help of Spain. 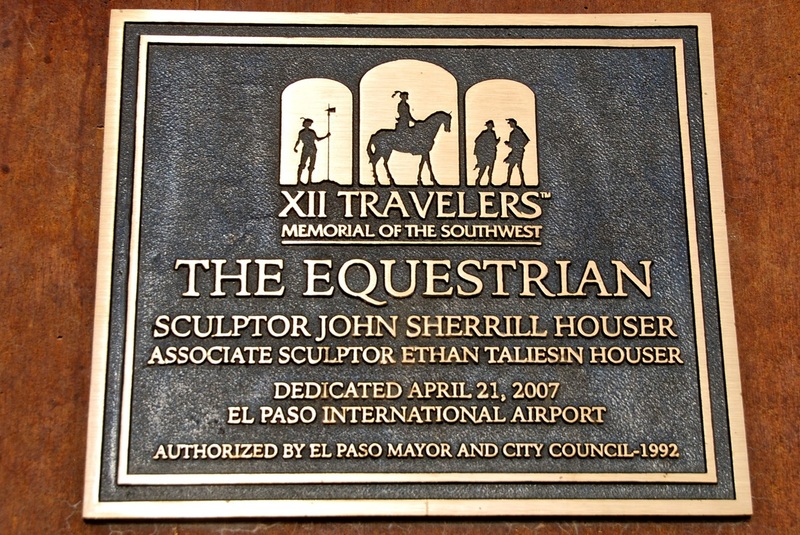 Spanish explorer Juan Antonio Maria de Rivera leads two small expeditions of horseback riders from Santa Fe, N,M., through present-day Colorado and Utah, and all the way up to the southern Rocky Mountains, becoming the first Europeans to explore that portion of southwestern North America. Dolores River in a northwestern direction, his expeditions cover territories inhabited by the Ute natives and establishes trade routes that would prove to the essential for other explorers who followed. 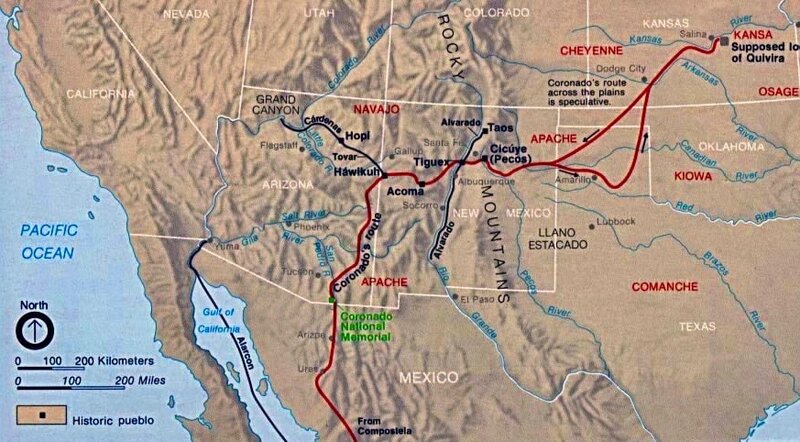 But fearing marauding Comanche raiders, he has to return to New Mexico, without finding significant gold or silver, or other Europeans encroaching on Spanish land. Yet he is also credited for naming many Colorado landmarks, including the Navajo, San Juan, Piedra, Pinos (Pine), Florida, Animas, and Dolores Rivers. 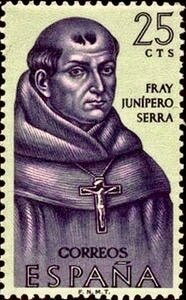 Father Junipero Serra, a Franciscan priest, arrives in California, from Baja California, as part of the Gaspar de Portolá overland expedition and establishes the San Diego De Alcalá Mission, the first of 21 Spanish missions built along the coast of California to convert the natives to Christianity -- and the foundation for today's City of San Diego. 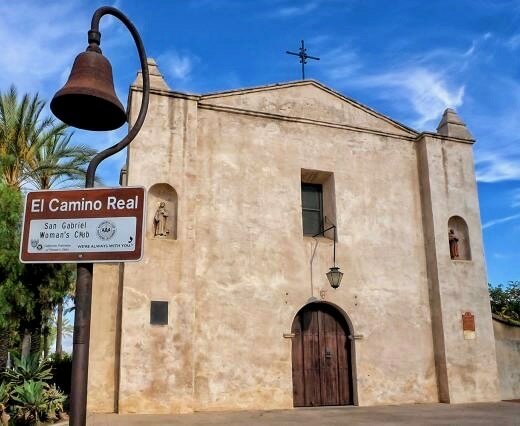 Known as the "Mother of all missions," San Diego De Alcalá marks the beginning of Catholicism in this region, and the gateway that opened California to Spanish and Mexican settlement. 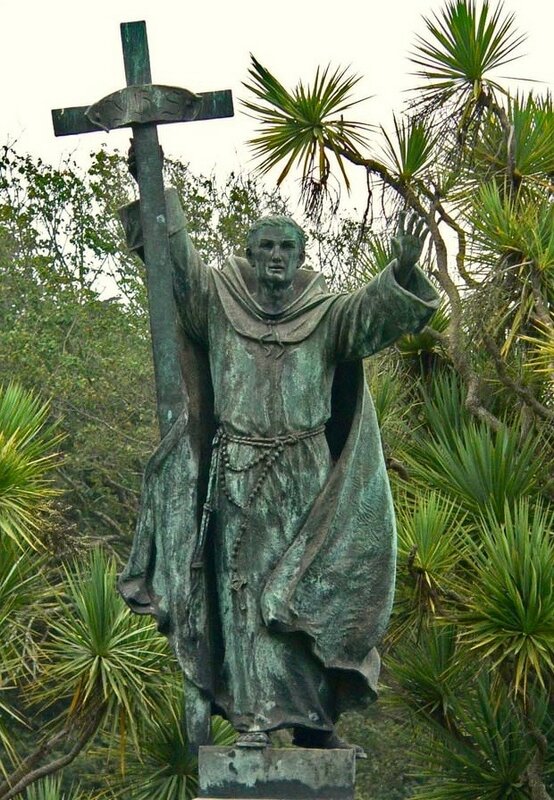 Juan Rodriguez Cabrillo had claimed California for the Spanish empire in 1542, but they did not settle in the area until Father Serra leads a groups of Franciscan priests who establish the first nine of California's 21 missions. 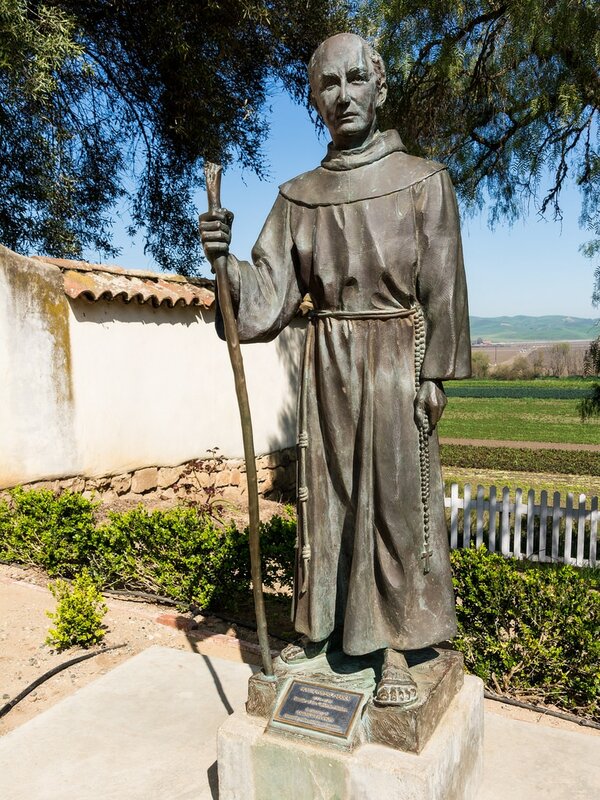 With a reliable source of water, fertile land, and the proximity to a Native American village, Father Serra choses the site of the mission, overlooking the Bay known today as Presidio Hill, to cultivate crops such as wheat, barley, corn, and beans. Today Father Serra is remembered for his dedication to his faith, and for bringing Catholicism to California. 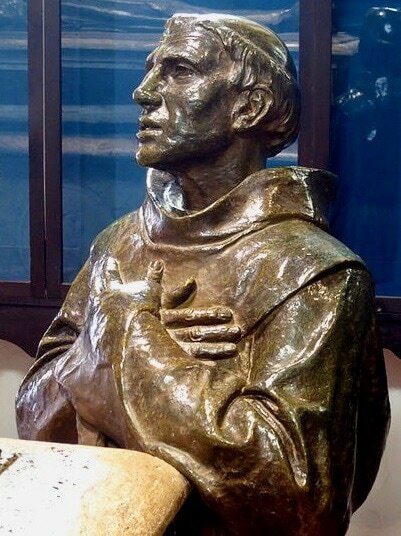 To recognize his dedication, Pope Francis canonized Father Serra during his first visit for the United States in 2015, at the Basilica of the National Shrine of the Immaculate Conception in Washington, D.C.
​ There is a bronze statue of Serra in the Statuary Hall of the U.S. Capitol. Throughout California, his work is recognized with statues -- in Ventura, Hillsborough, San Juan capistrano, Fremont, and Monterey. 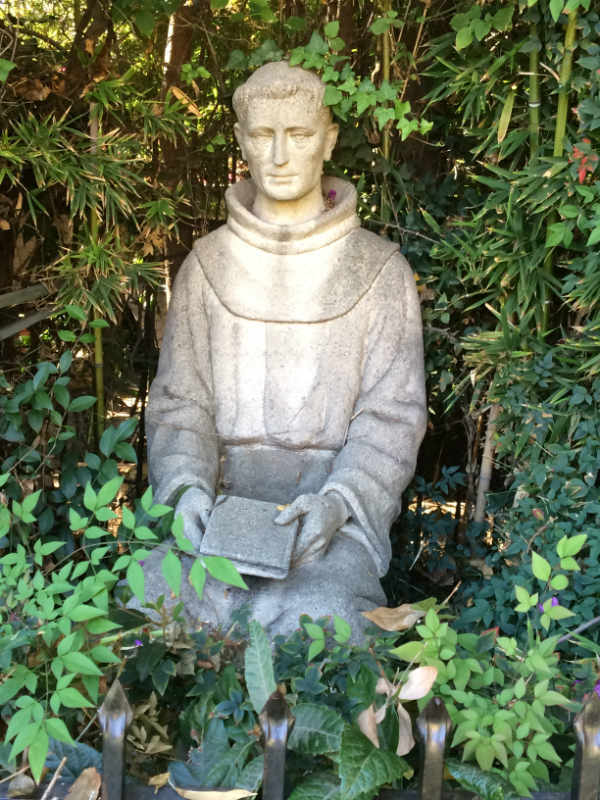 There is even a Junipero Serra Museum in Presidio Park, California. It showcases San Diego's cultural influences from the indigenous Kumeyaay to the Spanish, Mexican and early American settlers. 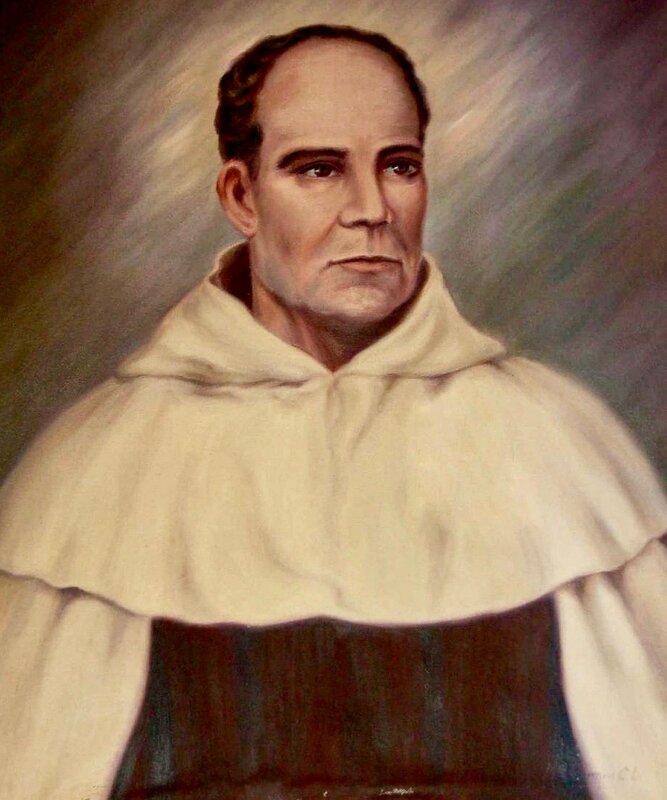 Father Junípero Serra, Roman Catholic Spanish priest and leader of Franciscan missionaries on the Gaspar de Portola expedition, establishes the San Gabriel Arcángel mission in present-day Los Angeles County, California to convert Native Americans to Catholicism. It is the fourth of 21 missions eventually built in California and the foundation for the City of San Gabriel. Originally planned to be built along the Santa Ana River, Serra changes the location to the slopes of Montebello, overlooking the San Gabriel Valley because of its fertile plain. Yet, the original mission is destroyed by a flood and is moved three miles northwest to where it stands today. The mission grew into a city, which although incorporated in 1913, had been the original township of Los Angeles County since 1852. 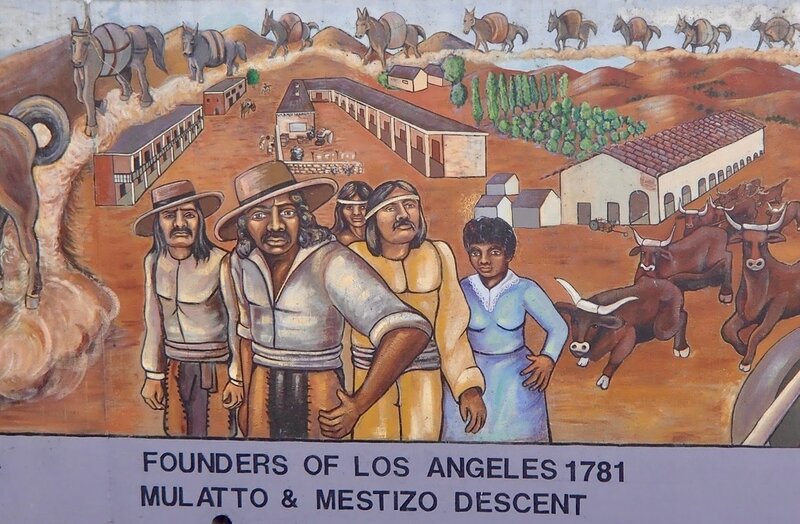 Although San Gabriel's motto is "A City with a Mission," it is also known as "The Birthplace of Los Angeles," since the pioneer Los Angeles settlers first gathered at San Gabriel mission before setting out to build "El Pueblo de Nuestra Señora La Reina de Los Angeles" in 1781. The march of the first Los Angeles pobladores, from the mission to downtown Los Angeles -- “Los Pobladores Historic Walk to Los Angeles” -- is still celebrated every year during labor day weekend. The mission still serves as an active Roman Catholic Church. The mission grounds, cemetery, museum and gift shop are open to visitors daily. Presidio San Agustín del Tucsón, the foundation for the City of Tucson, Ariz., is established by Spanish army soldiers led by Captain Hugh O’ Connor, an Irish mercenary working for Spain, also known as El Capitan Colorado (The Red Captain). Seeking to gain greater control of Arizona and strengthen New Spain's northern border, O'Connor decides to move the Spanish fort at Tubac, Ariz., built 23 years earlier, almost 50 miles north, to an area surrounded by mountain ranges, the site of present-day Tucson. But the original Tucson fort is poorly constructed, and, after an Apache assault in 1783, its palisade (wooden stakes) fence is replaced by an 8 to 12-foot-high a mud-brick wall that is about 700 feet long on each side -- making the Tucson Presidio one of the strongest and largest frontier forts. After the Americans arrive in 1856, the original walls are demolished, with the last section torn down in 1918. But almost a century later, following an archaeological excavation that located the fort's northeast tower, the northeast corner of the fort is rebuilt in downtown Tucson in 2007. It is now a museum paying tribute to Arizona's Spanish history, at 196 N Court Ave, Tucson, AZ. It is open Wednesday thru Sunday, from 10 a.m. to 4 p.m. Admission is $5 for adults and $1 for children. They offer guided tours and "Living History Days" with Volunteer re-enactors of life at the fort in the late 1700s. 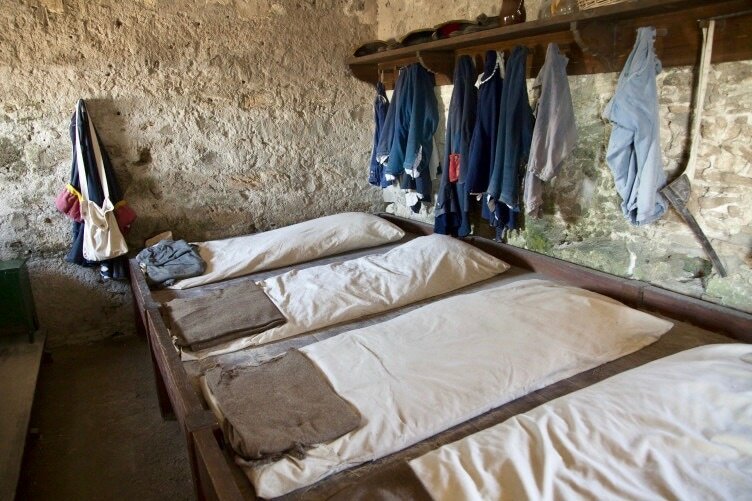 Museum visitors can see the small living quarters of a military family, the barracks where some soldiers stayed, the ammunitions room, and the presidio warehouse where food and other commodities were kept. Visitors can an enjoy Spanish colonial food, listen to the stories of early Tucsonans and get a glimpse into the lives of Spanish-Americans in the 18th century. 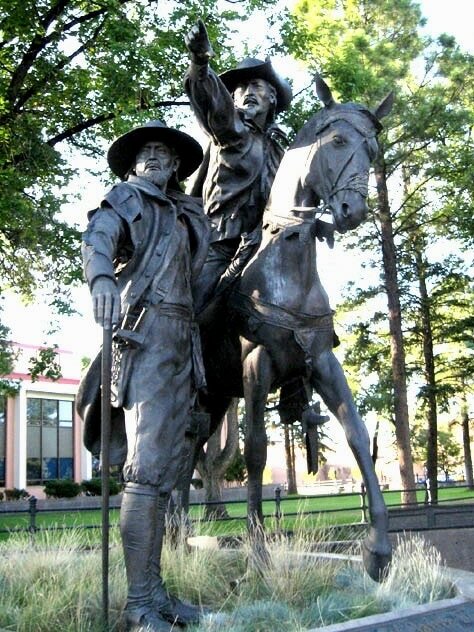 Spanish Army Lieutenant José Joaquin Moraga and Francisican missionary Francisco Palóu reach San Francisco Bay as part of the 1,000-mile Juan Bautista de Anza overland expedition from present-day southern Arizona and establish Mision San Francisco de Asis, also known as Mision Dolores -- the foundation of what is to become the City of San Francisco. ​ While the 13 American colonies on the east of North America are declaring their independence from Great Britain, on the west coast, Father Palóu dedicates the site and celebrates the mission's first mass on June 29, 1776 -- only a few days before the American Founding Fathers signed the Declaration of Independence. The mission, of wood poles plastered with mud and thatched roofs, is formally founded with a great celebration on Oct. 9, 1776. At a nearby site designated by De Anza, three months earlier, Moraga also leads the construction of the Presidio of San Francisco, formally established on September 17, 1776. Mission San Francisco is the sixth of 21 Spanish missions to be established in California by Franciscan missionaries, to convert the native people to Christianity, colonize the area and to consolidate Spanish power. But, like many other missions, this mission is not just a religious institution; it quickly becomes the gathering center for soldiers, farmers, traders, and native peoples, with a significant number of Indian converts who become resident community members and perform all of the tasks necessary to keep the community running. Both the mission and the presidio are named after Saint Francis of Assisi, founder of the Franciscan Order in Italy, and already the namesake of San Francisco Bay. The name San Francisco de Asis was first given to a small bay (now Drake Bay) by Spanish explorer Sebastián Cermeño and was later applied to the bay. Today, Mission Dolores, recognized as a California Historical Landmark, is the oldest surviving structure in San Francisco. The old mission chapel is part of a much larger structure dedicated in 1918 and granted Basilica status in 1952. The Presidio of San Francisco, designated a National Historic Landmark in 1962, is now a park on the northern tip of the San Francisco Peninsula, part of the Golden Gate National Recreation Area. 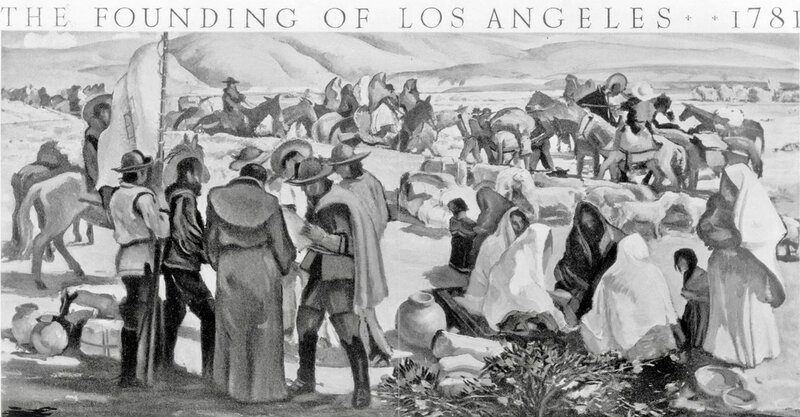 A group of about a dozen families from Sinaloa, Mexico establish El Pueblo de Nuestra Señora La Reina de Los Angeles (The Town of Our Lady, the Queen of the Angels), now known as Los Angeles, California. 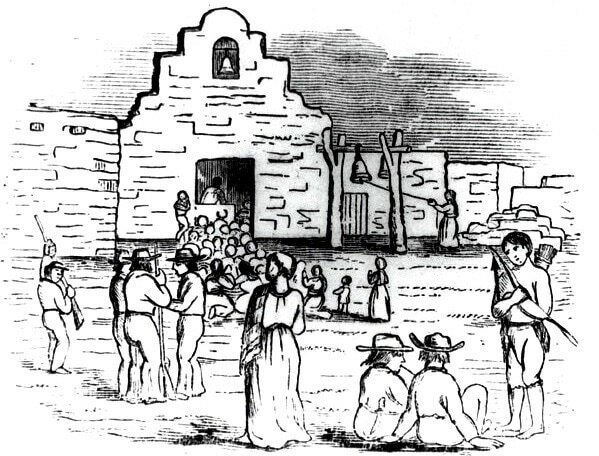 The 44 settlers – 22 adults and 22 children – had first gathered at San Gabriel Mission, established 10 years earlier, from where they set out looking for the right site for the new town. Escorted by a military detachment and two priests from the mission, they settle in what in now downtown Los Angeles. The "Pobladores" of Los Angeles, mostly farmers, rapidly establish a successful community. The streets of downtown Los Angeles still follow the same pattern of the streets of the old colonial town. The old town limits are still marked by Hoover and Indiana Streets in the west and east respectively. Today, Los Angeles embraces and recognizes its beginning by celebrating the annual "Los Pobladores Historic Walk to Los Angeles." It happens over the Labor Day weekend and coincides with the anniversary of the city's founding. It is organized by Los Pobladores (Townspeople) 200, an association of the descendants of the original 44 settlers and soldiers who accompanied them. The walk starts from the San Gabriel Mission to El Pueblo de Los Angeles, and follows the historic route that was taken by Los Pobladores. 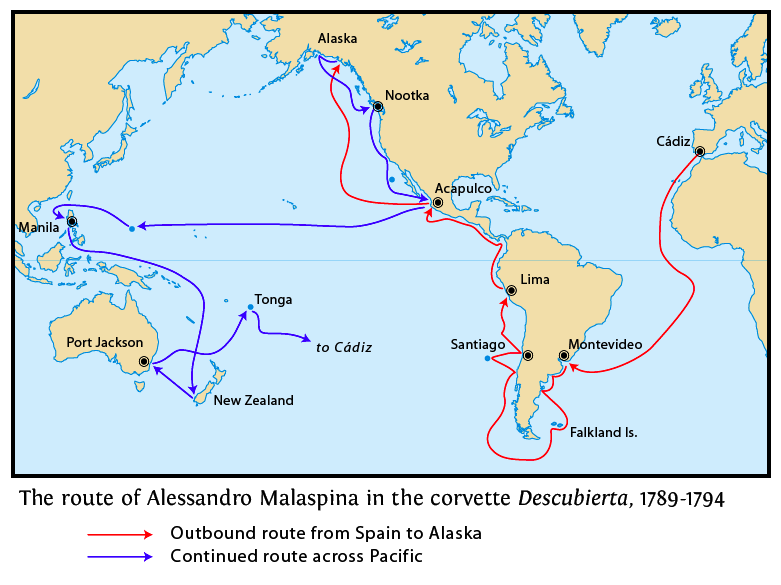 Alessandro Malaspina an Italian-born Spanish naval officer leads a two-ship scientific expedition from Cadiz, Spain across the Atlantic Ocean, around Cape Horn and all the way up the West coast of the Americas to the Gulf of Alaska. 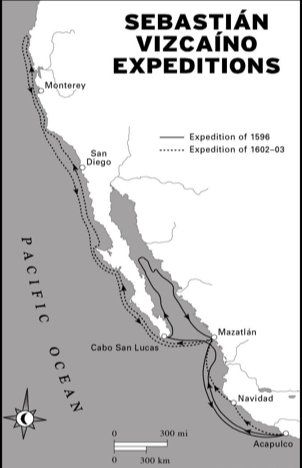 Although he expects to sail from Mexico across the Pacific Ocean, by the time he gets to Mexico, Malaspina receives orders from the King of Spain to continue northward along the Pacific Coast of North America in search of the Northwest Passage, that long-sought waterway that would connect the Atlantic and Pacific Oceans. 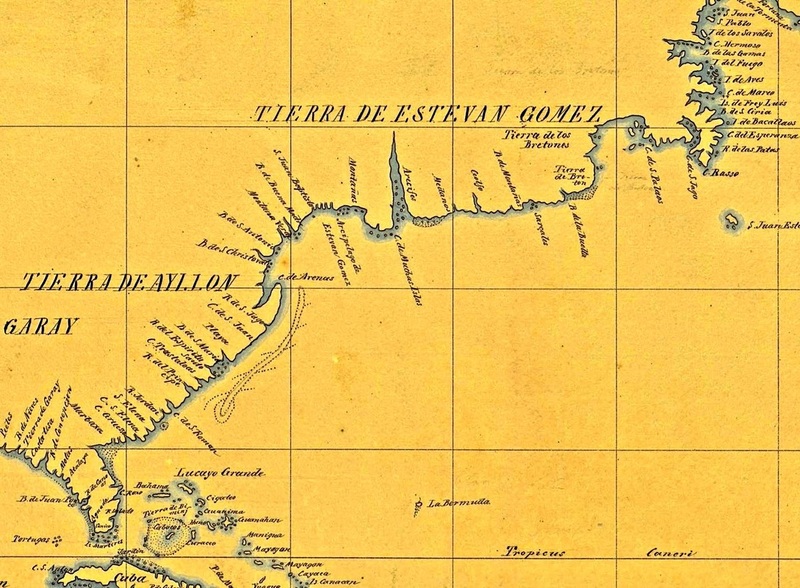 Sharing command of the voyage with another Spanish naval officer, José de Bustamante y Guerra, the Malaspina expedition sails from Acapulco, Mexico directly to Yakutat Bay, Alaska. Although they supposedly share "dual command," even de Bustamante acknowledges that Malaspina is the chief the expedition. 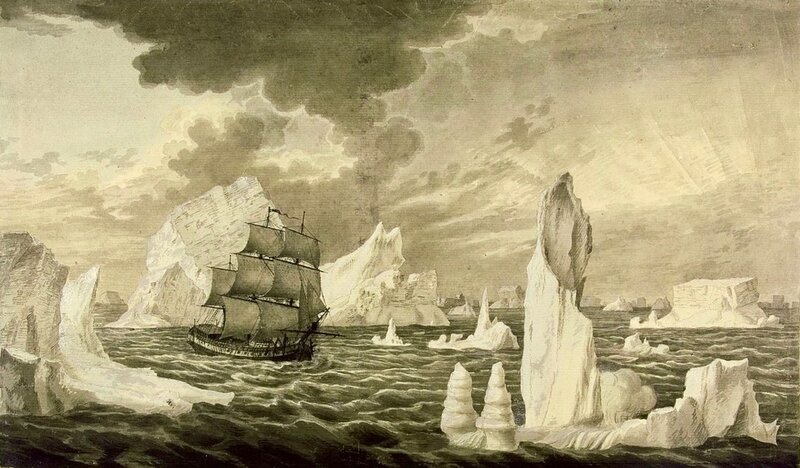 They never find the illusive Northwest Passage, but the expedition and its Spanish scientists spend a month studying the lifestyle of the Tinglit, the indigenous people of the Pacific Northwest Coast of North America. Spanish scholars study and document the Tinglit's language, customs, economy, warfare methods and even burial practices. Spanish artists paint portraits of the tribal members and sketch scenes of Tinglit daily life. Spanish botanists collect many new plants. They also surveyed the Alaska coastline, measured the height of Mount Saint Elias and explored huge glaciers, including the Malaspina Glacier, subsequently named after him. 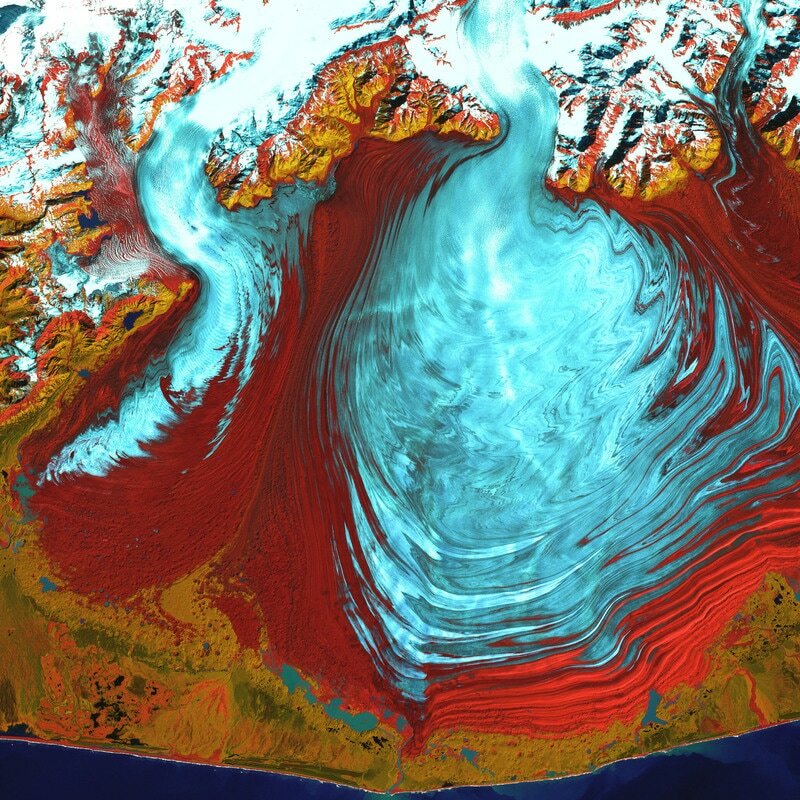 Aside from the Malaspina Glacier in southeastern Alaska, which is the world's largest piedmont glacier, there is also a Mt. Malaspina and a Malaspina Lake in Alaska, and a Malaspina Strait, a Malaspina Village and Malaspina Provincial Park in Canada. Franciscan missionary Fermín Francisco de Lasuén establishes Misión San Fernando Rey de España in present-day Mission Hills, Los Angeles County, California. 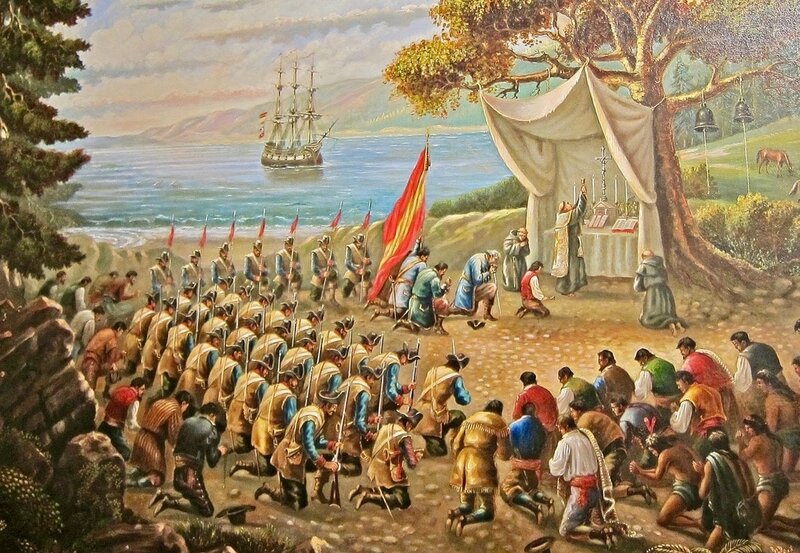 It is the 17th of 21 Spanish missions to be established in California to convert the native people to Christianity, colonize the area and to consolidate Spanish power. It is also the fourth mission established by de Lasuén in as many months. 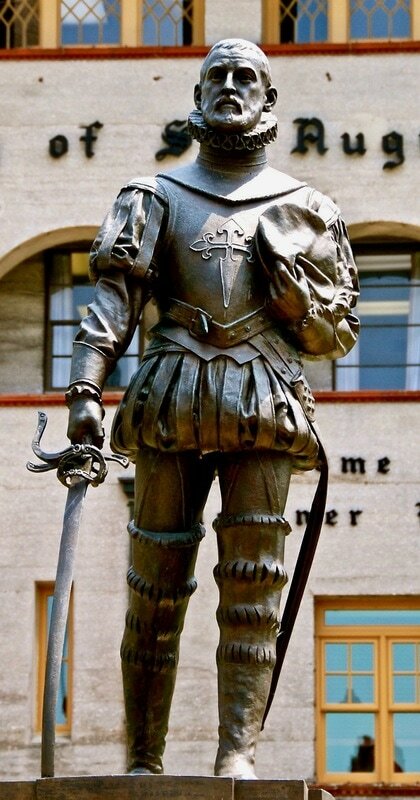 Named for Ferdinand III, King of Spain (1217-1252), the mission becomes the namesake for the nearby City of San Fernando and the San Fernando Valley. 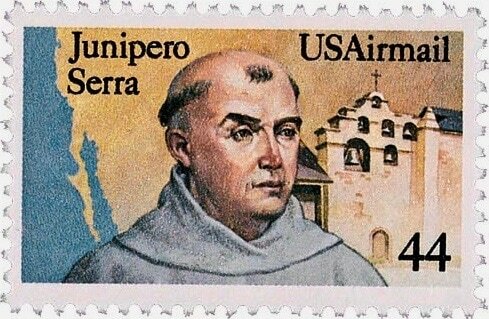 After the death of Father Junípero Serra in 1784, Father de Lasuén was appointed the second Presidente of the missions of California in 1785, and has continued the missionary work begun by Father Serra -- establishing settlements where Spanish settlers and Native Americans can coexist in harmony. But life is tough for the first few years after these missions get started. 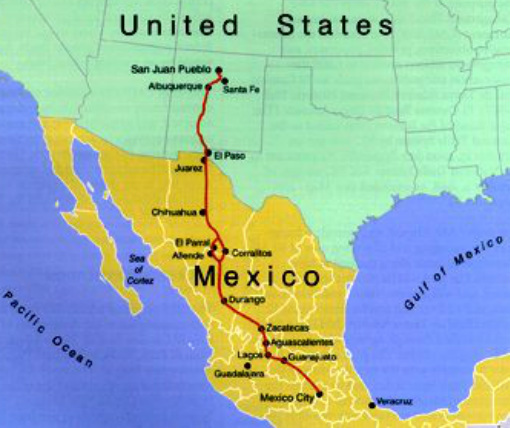 Spanish settlers and Native Americans initially depend on supplies delivered by sea from New Spain. It normally takes a few years before they can plant sufficient crops and raise enough cattle to become self-sufficient. But sometimes the supples are hard to come-by. And because both the settlers and the natives have an urgency to survive, there is always a rush to train the natives on European-style farming. The quadrangle-shaped mission is built with adobe bricks by the Tongva natives of the region. 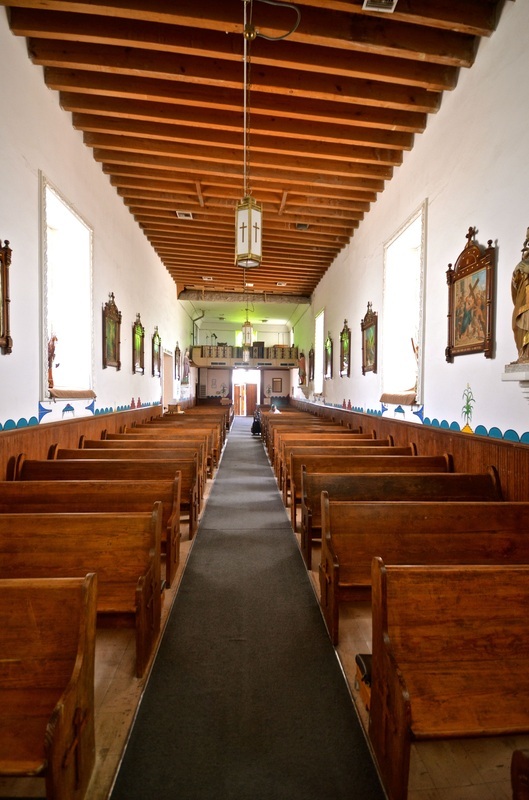 The mission's convento (main building) took 13 years to build and was completed in 1822, becoming the largest two-story adobe mission building in California. 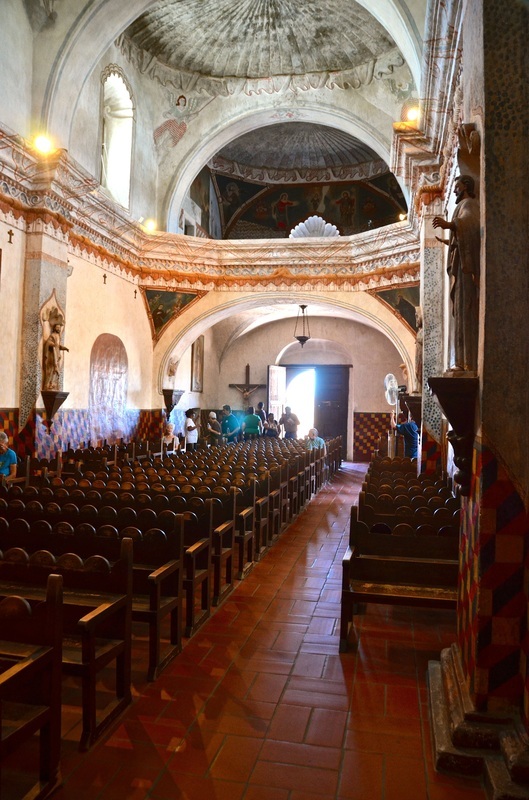 Today, the convento remains as the only original building at this mission, which serves as a museum and as the Archival Center for the Archdiocese of Los Angeles. The mission church is an active Roman Catholic Church. Who Came Next? Quien Vino Después? And tell us: "Who or What Came Next?" https://www.facebook.com/HiddenHispanicHeritage Y díganos: "™Quién o Qué Vino Después?" Please note that this timeline will be devoted to the Hispanic presence in North America starting on April 2, 1513. For those who believe the timeline should begin much earlier and cover our antecedents in Latin America and Spain, here's a good Latin America Timeline and a not-so-good Time-line of Latin America. But please note that they exclude everything that happened in North America - even the accomplishments of the conquistadores who came north from the Caribbean and Mexico and the Hispanics who followed them! With our timeline, our goal is to fill the huge gaps that leave U.S. Latinos out of both U.S. and Latin American history.